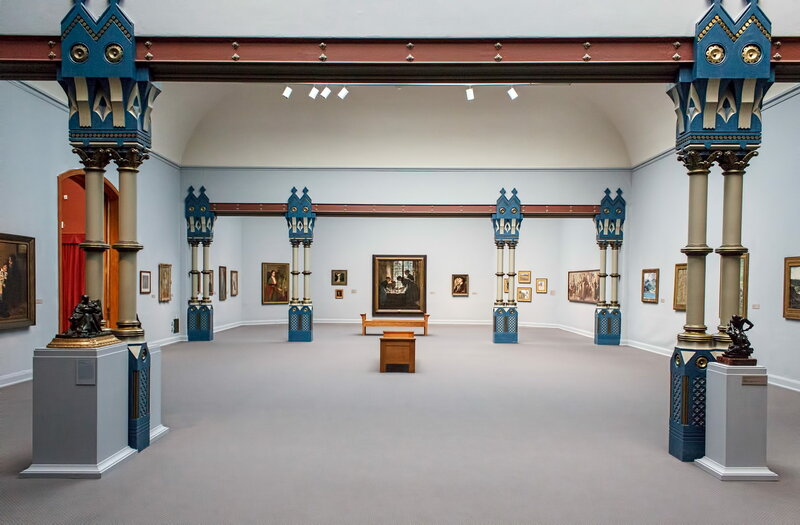 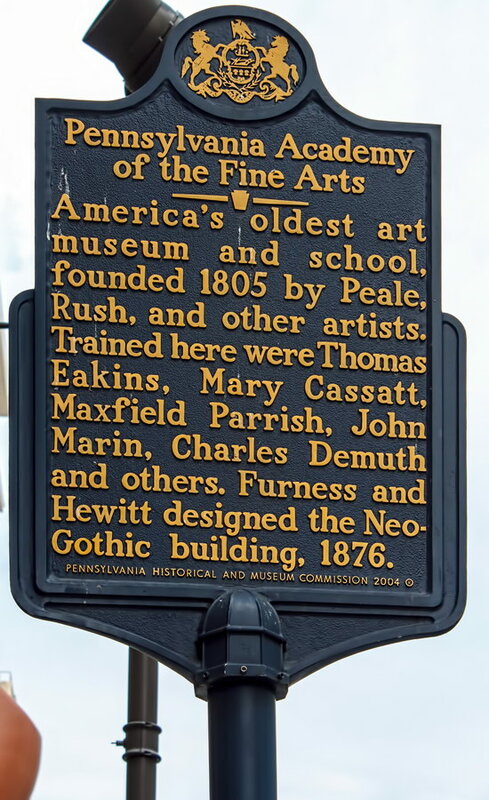 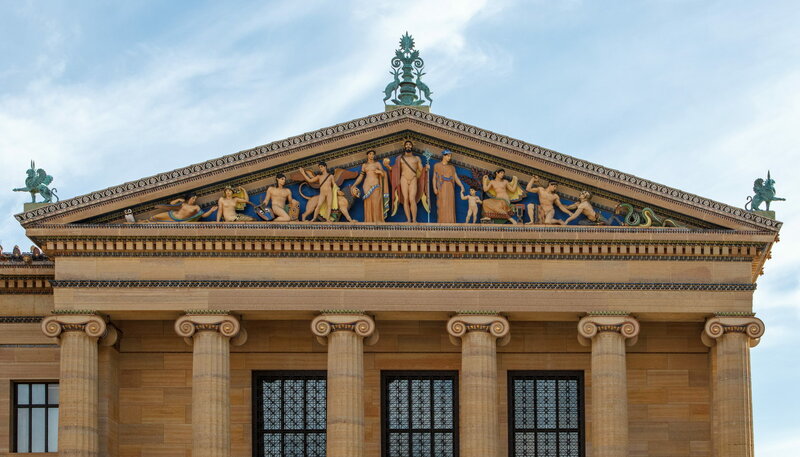 February 21, 2015 Philadelphia1928, 2600 Benjamin Franklin Parkway, C. Clark Zantzinger, Charles L. Borie Jr., Greek Revival, Horace Trumbauer, Museum District, Philadelphia. 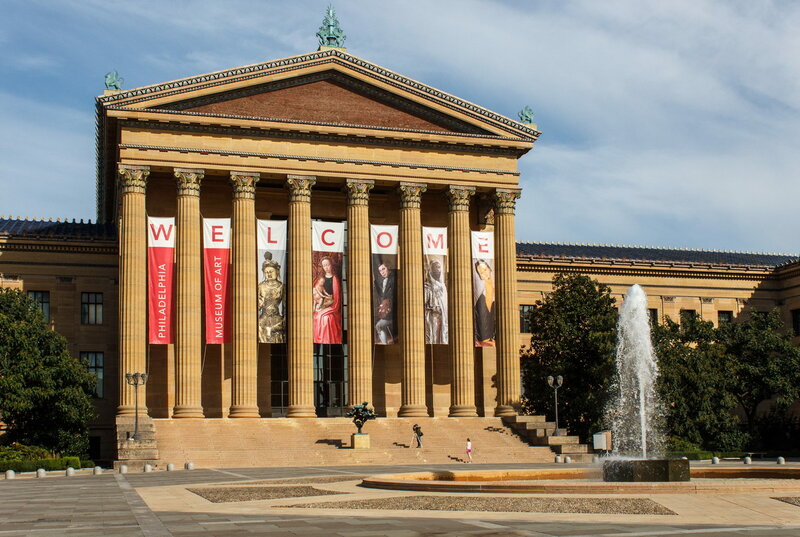 The Philadelphia Museum of Art is the third-largest art museum in the United States – but may be better known for its steps, a backdrop for the movie “Rocky.” Probably not a good testament to American culture. 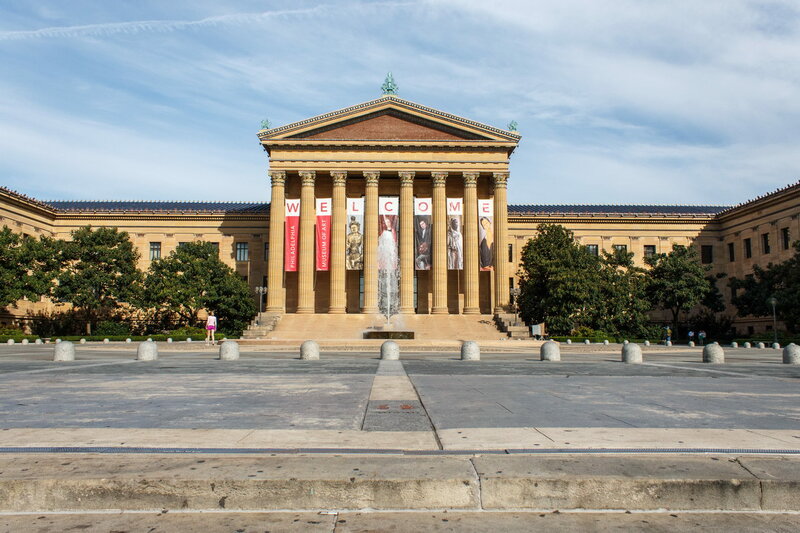 But art imitates life imitates art: On any given day you’ll see scores of people running up those steps, and a monumental statue of “Rocky” now stands just east of the base of the steps. 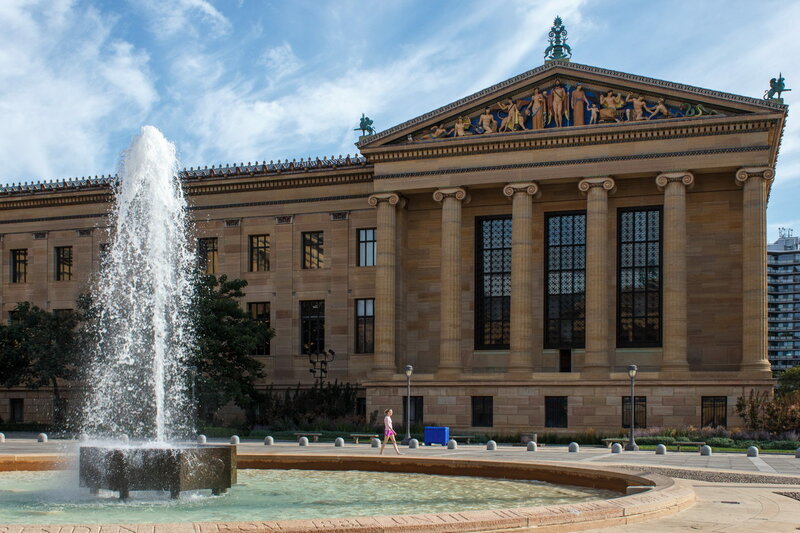 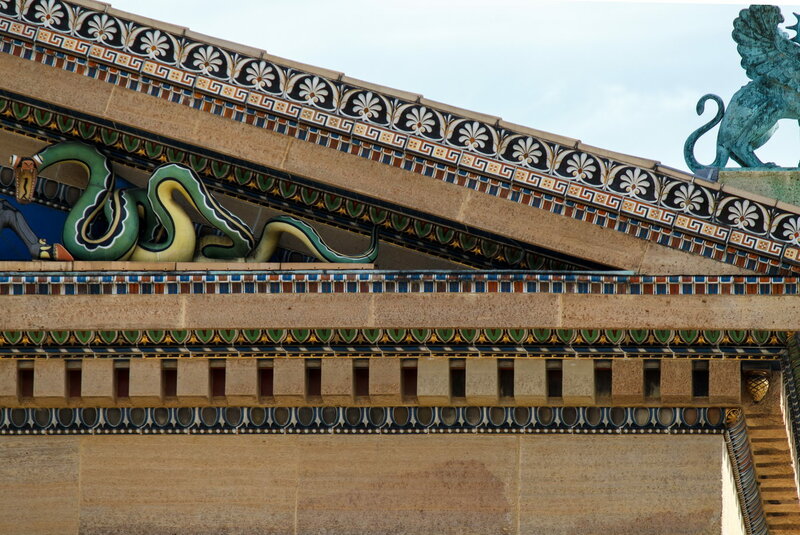 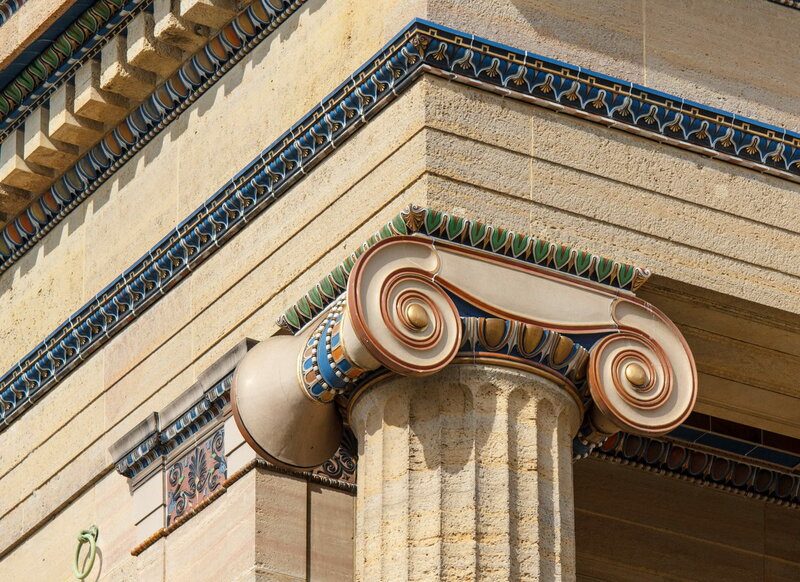 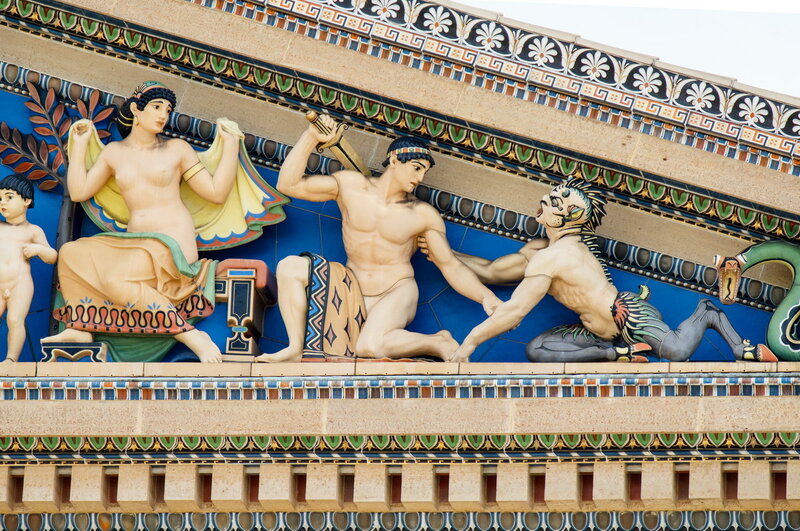 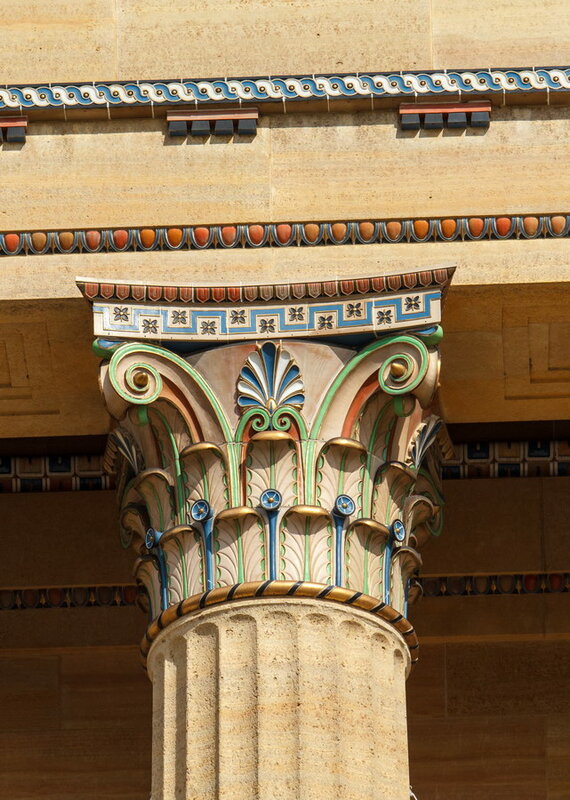 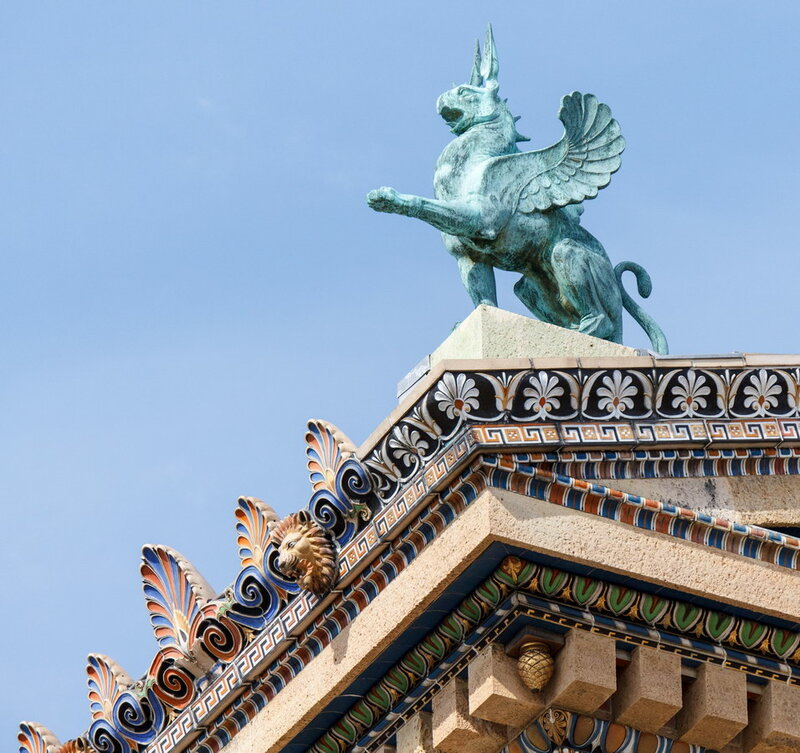 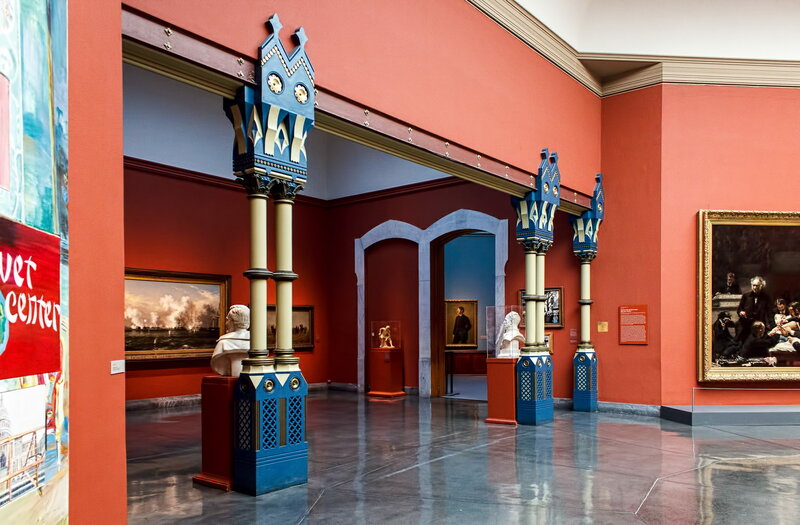 The museum is constructed as three Greek temples atop Faire Mount, at the northwest end of Benjamin Franklin Parkway. 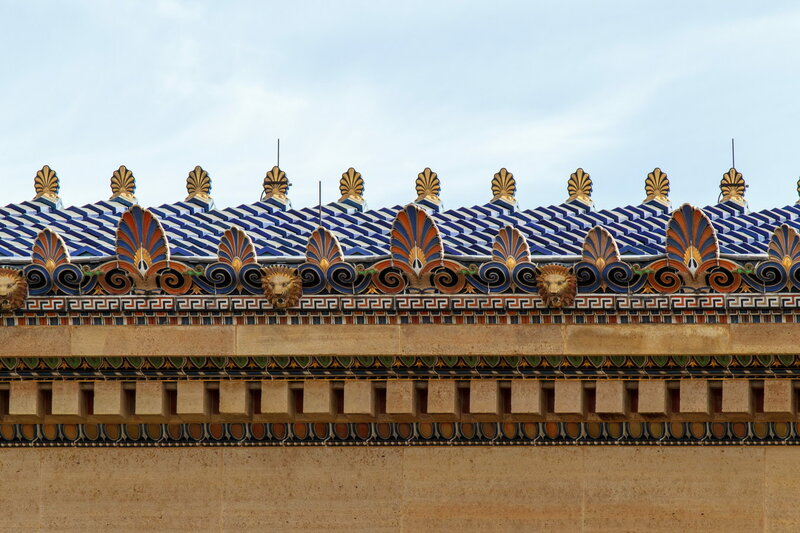 While the center temple is the principal building, the north temple has the most elaborate pediment. 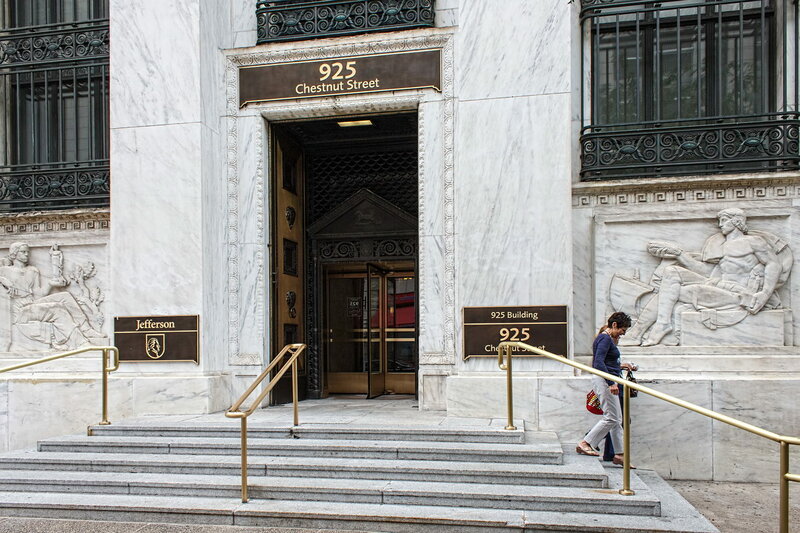 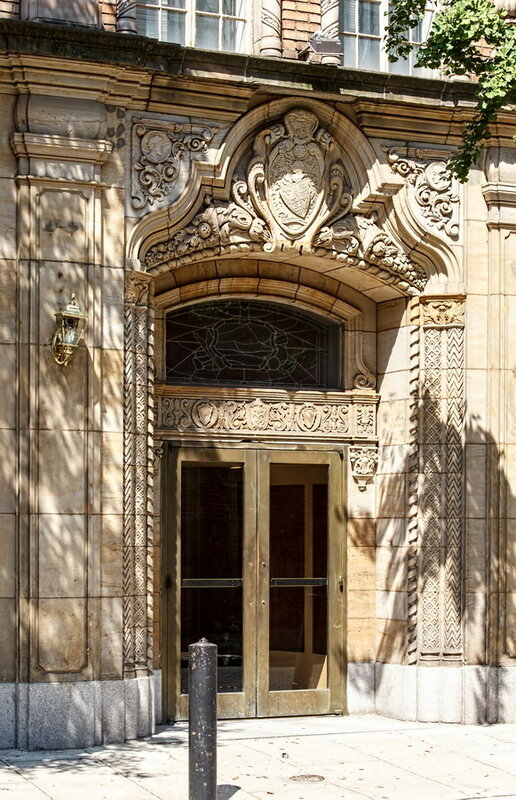 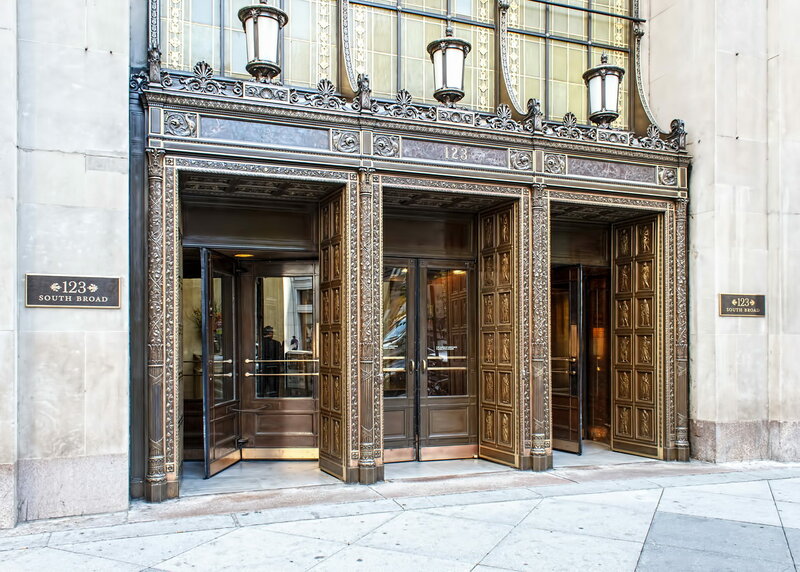 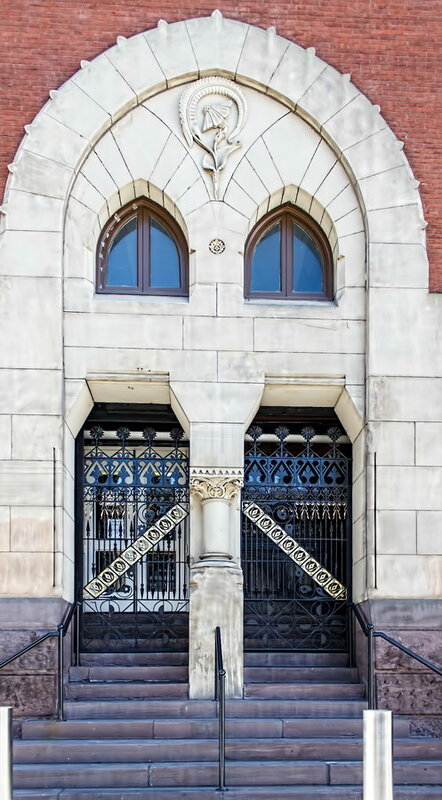 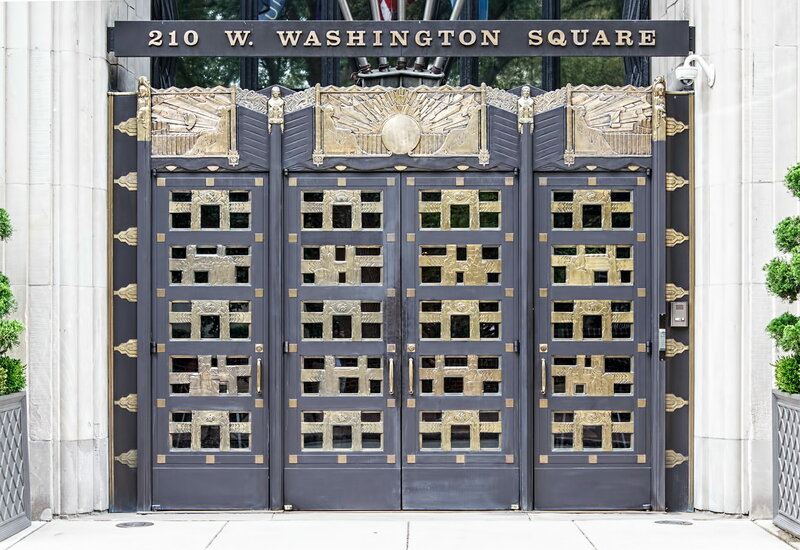 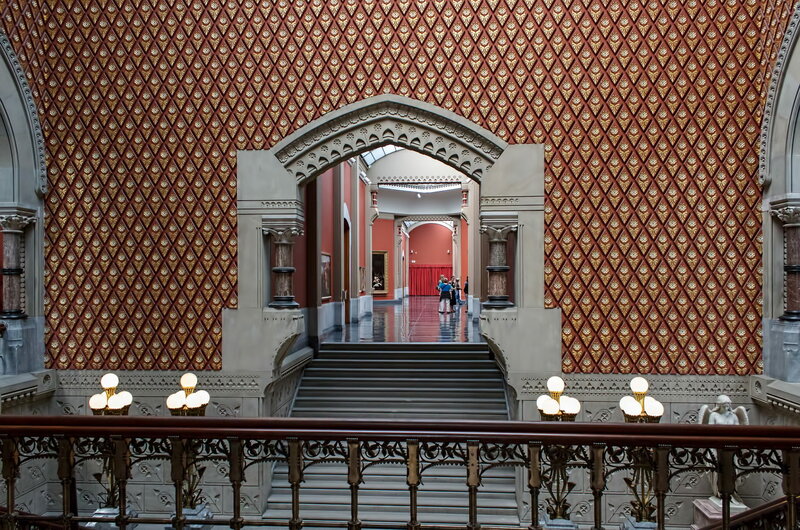 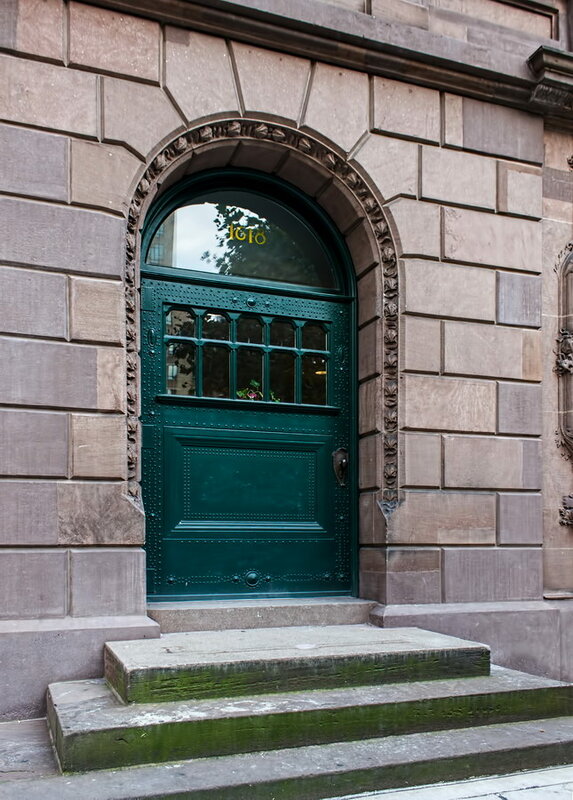 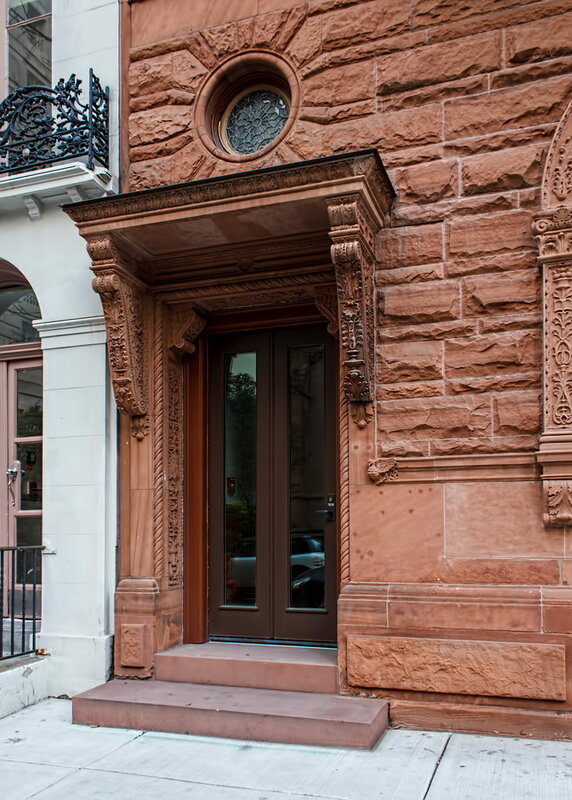 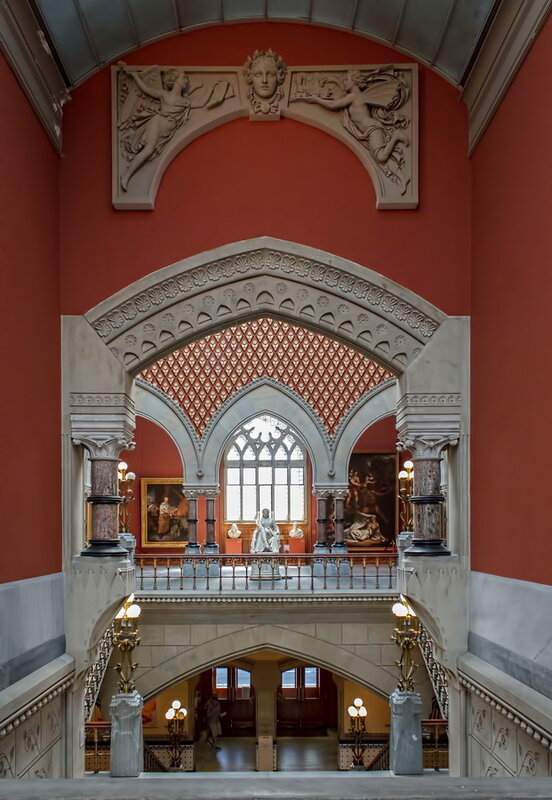 Architect: Horace Trumbauer, C. Clark Zantzinger, Charles L. Borie, Jr.
February 21, 2015 Architecture, Collections, Philadelphiaarchitecture, door, Philadelphia. 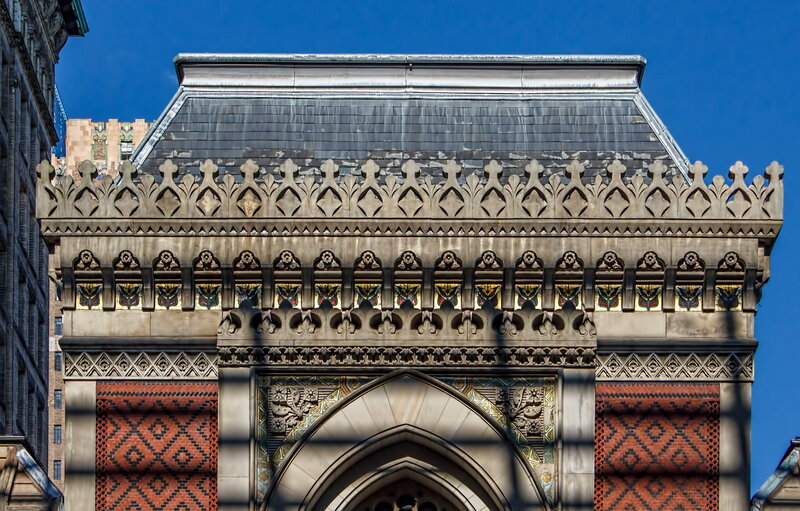 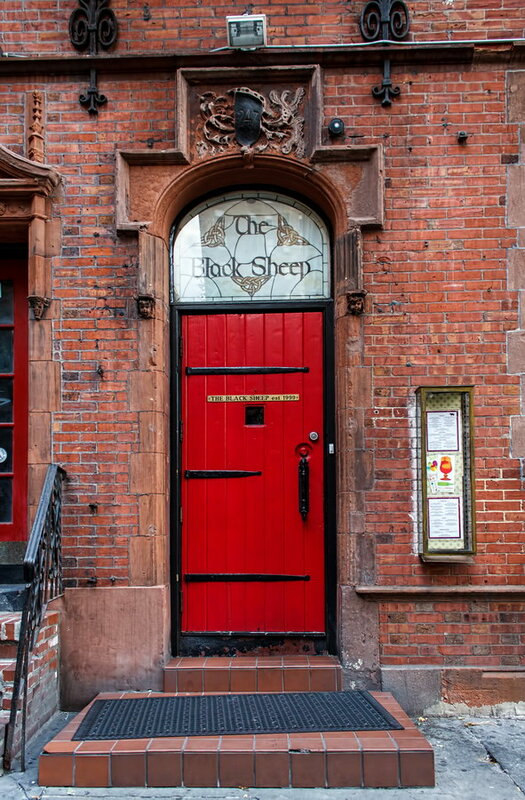 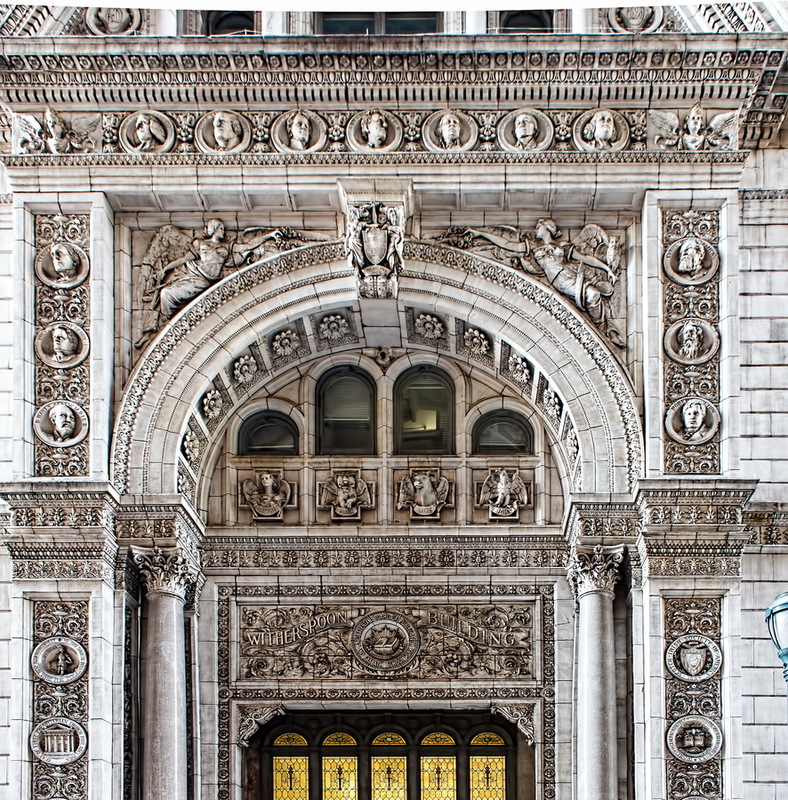 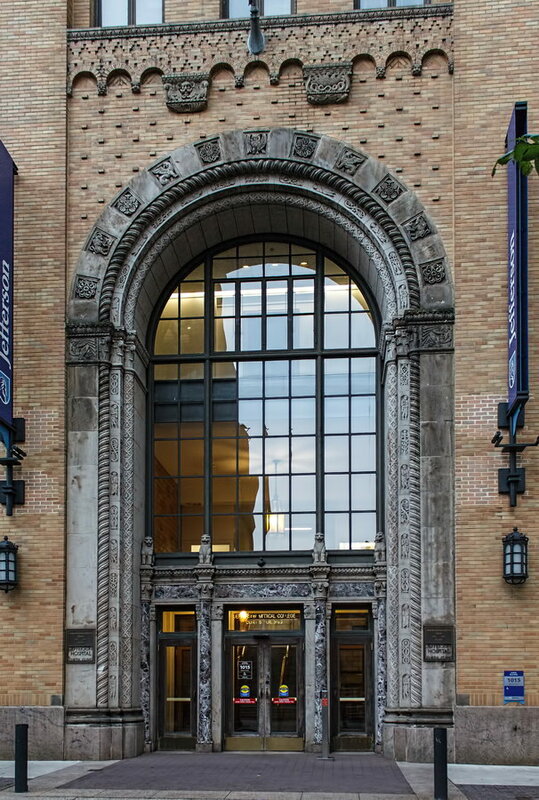 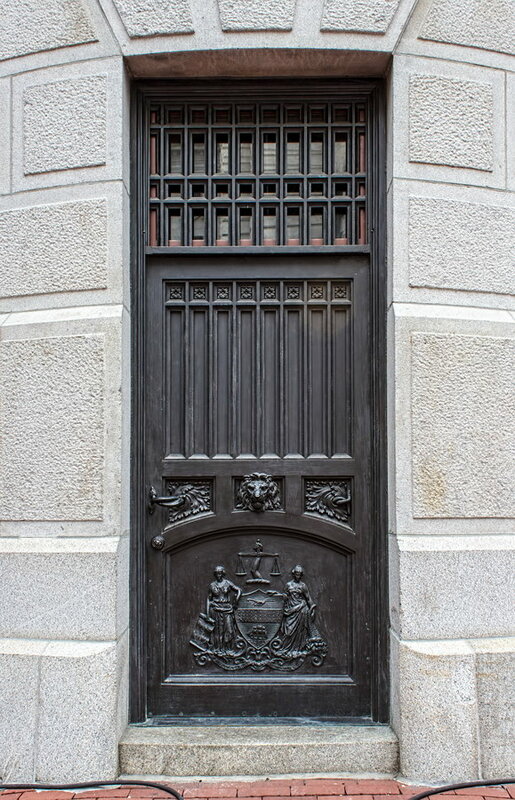 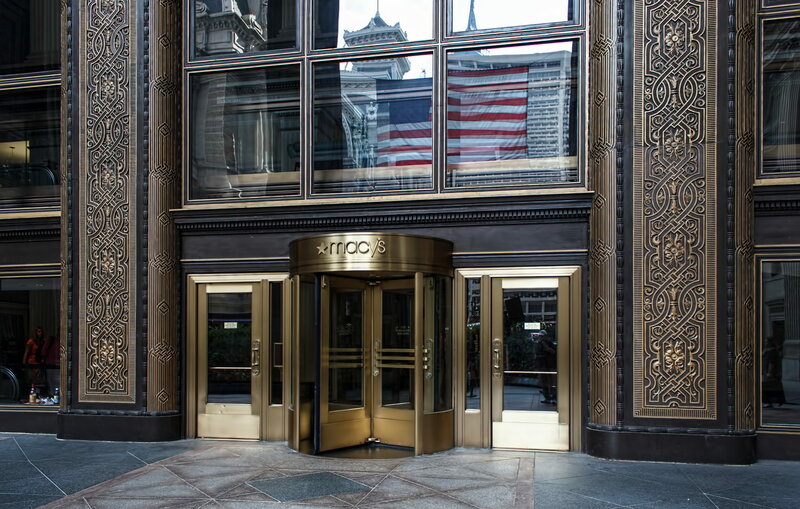 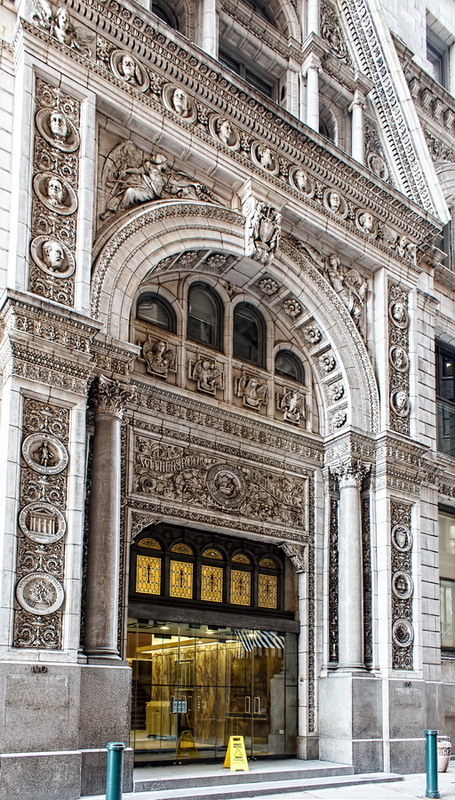 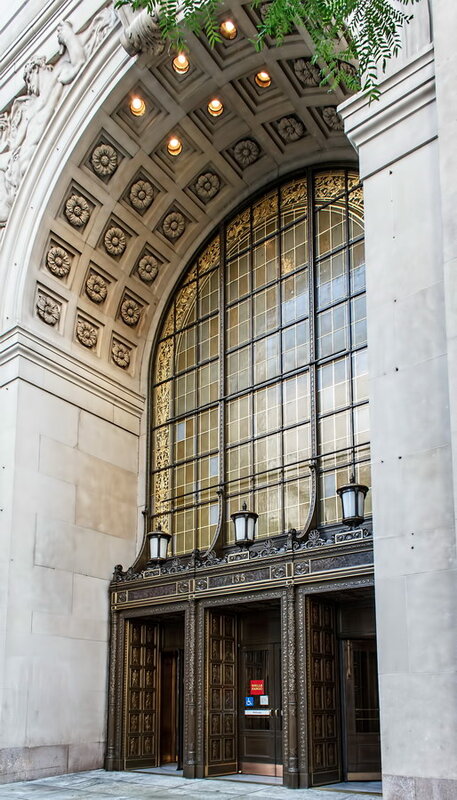 Every building has an entrance; some are more distinctive than others. 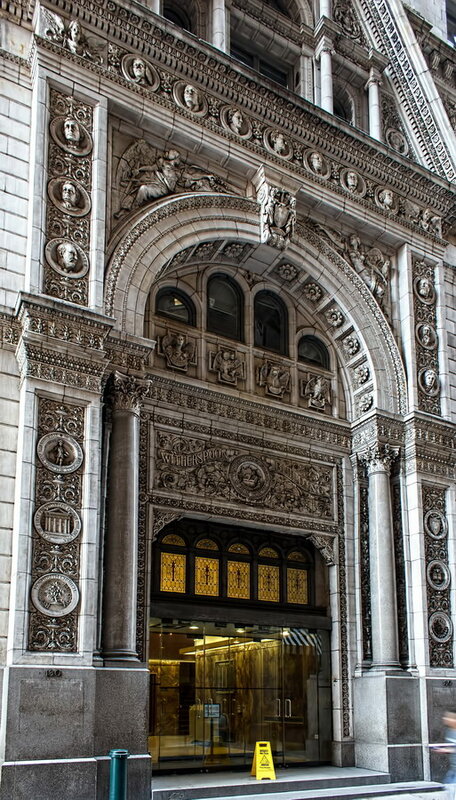 Some are modest, some are grandiose; some blend in with their facades, some are colorful attention-getters. 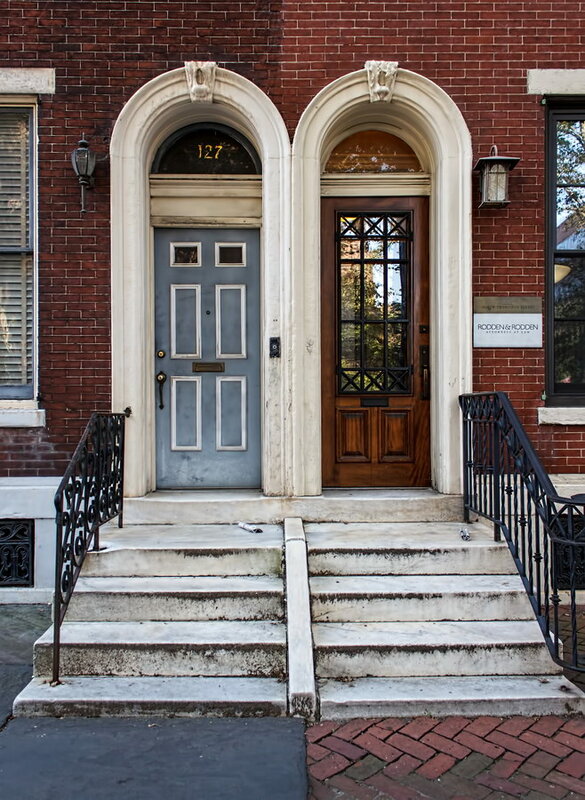 Here are some of my favorite doors of Philadelphia. 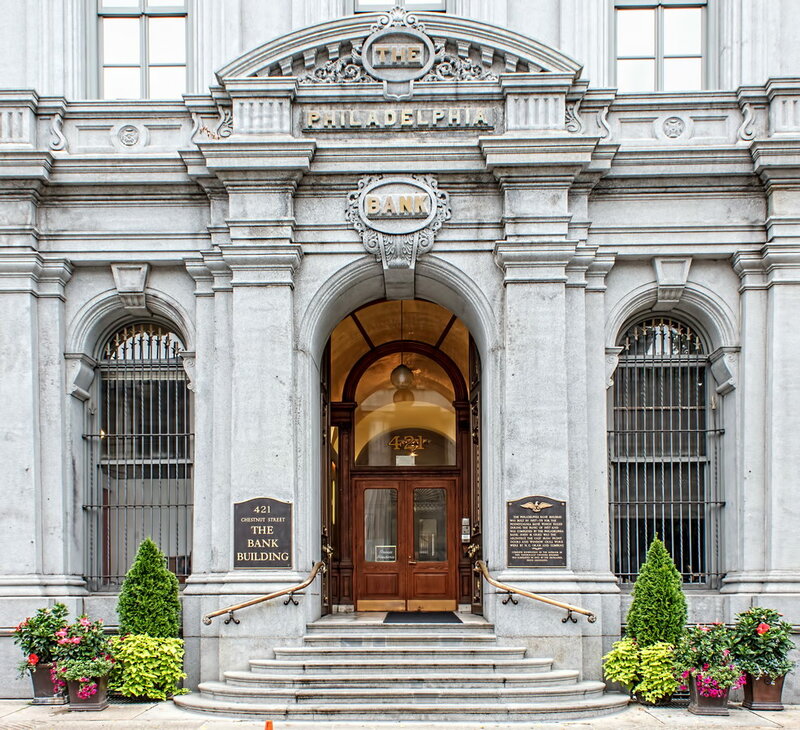 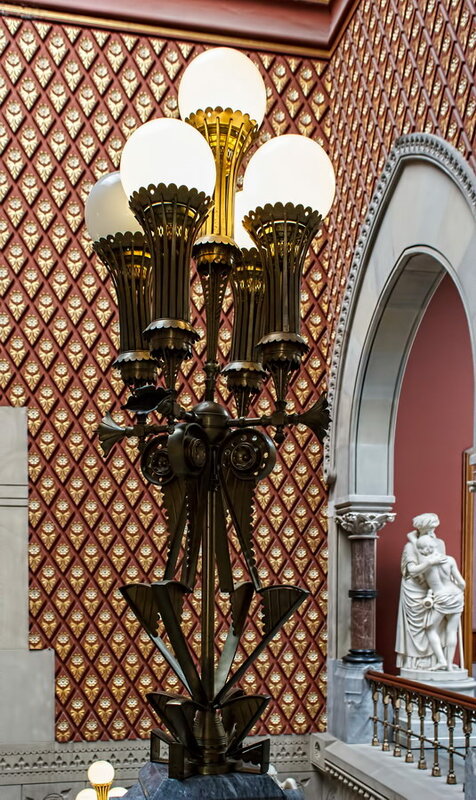 February 20, 2015 Philadelphia1370 Fairmount Avenue, 1894, apartments, historic, hotel, landmark, Philadelphia, Victorian, Willis Gaylord Hale. 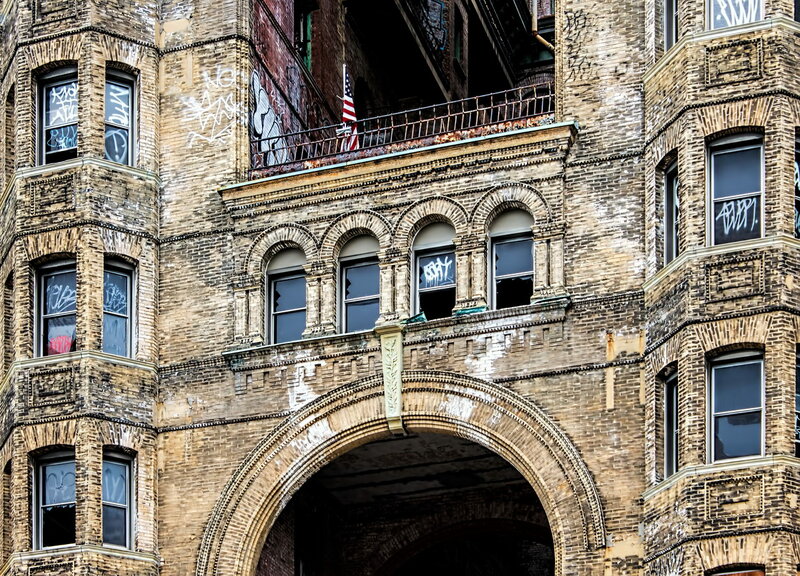 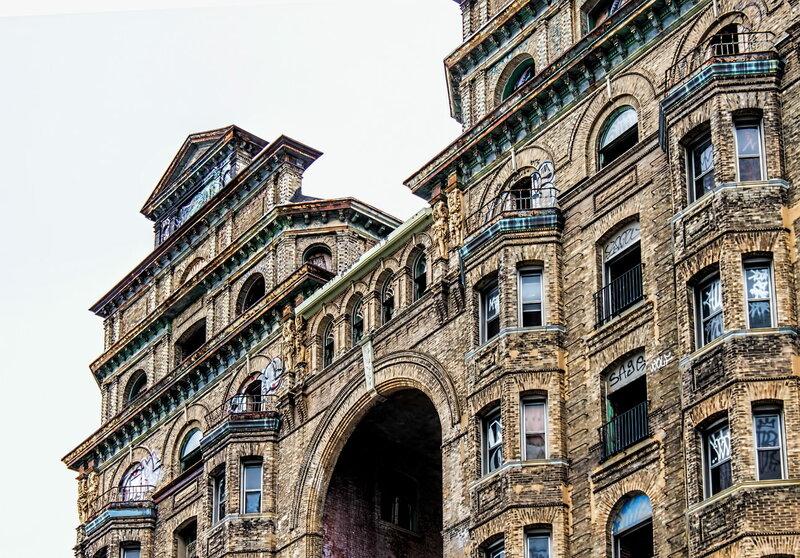 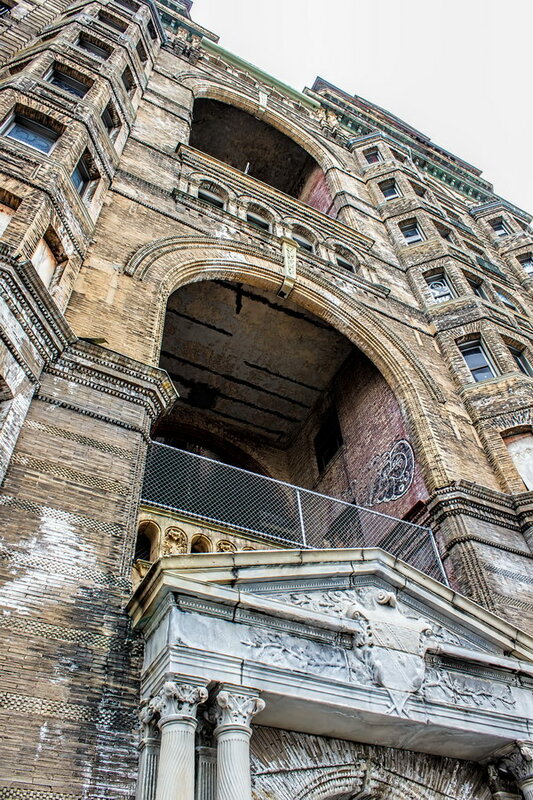 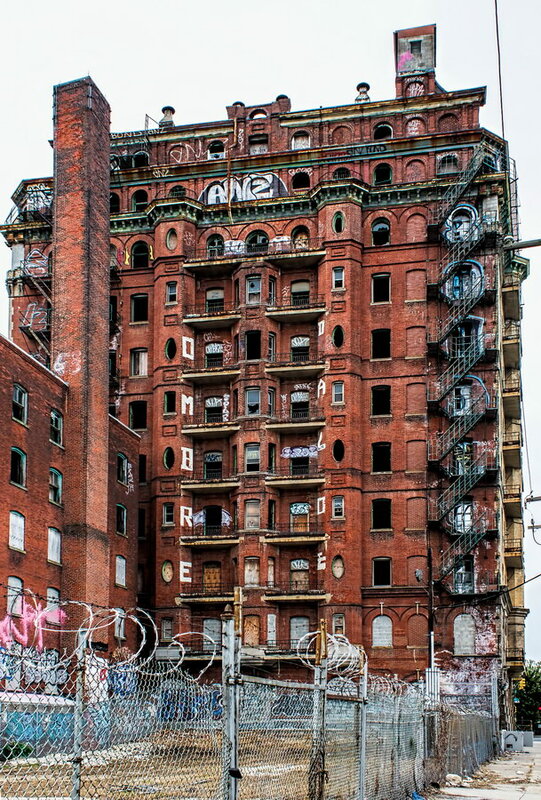 Divine Lorraine Hotel is a fabulous Philadelphia ruin awaiting revival – ten blocks east of Philadelphia’s other fabulous ruin, Eastern State Penitentiary. 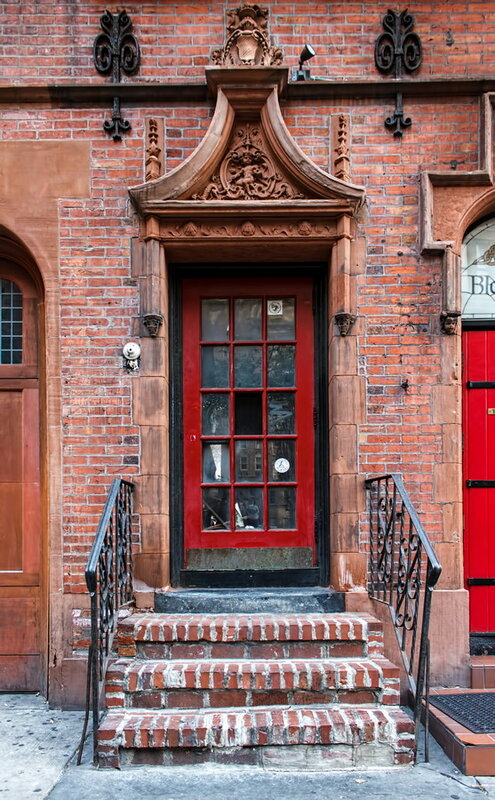 What earns it a spot in NewYorkitecture.com is that it was a New Yorker who made it Divine in the first place. 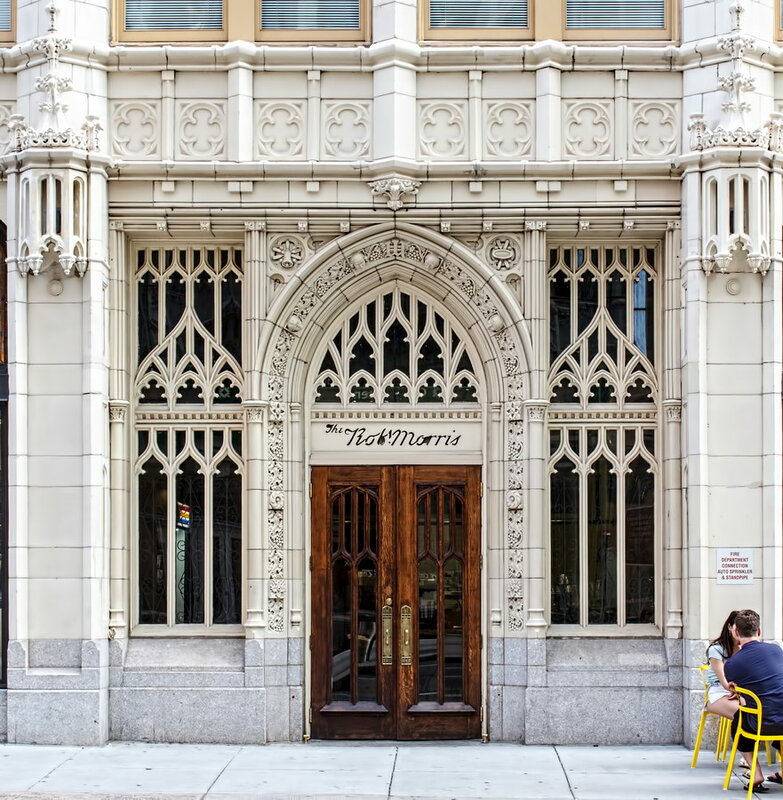 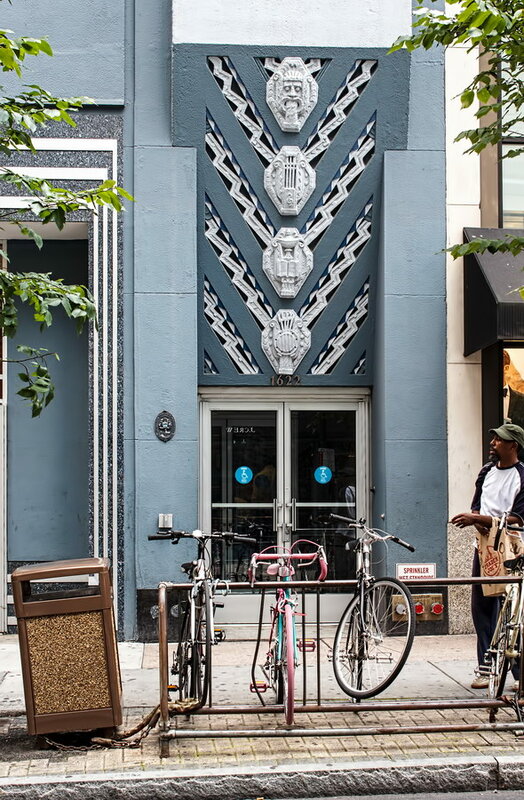 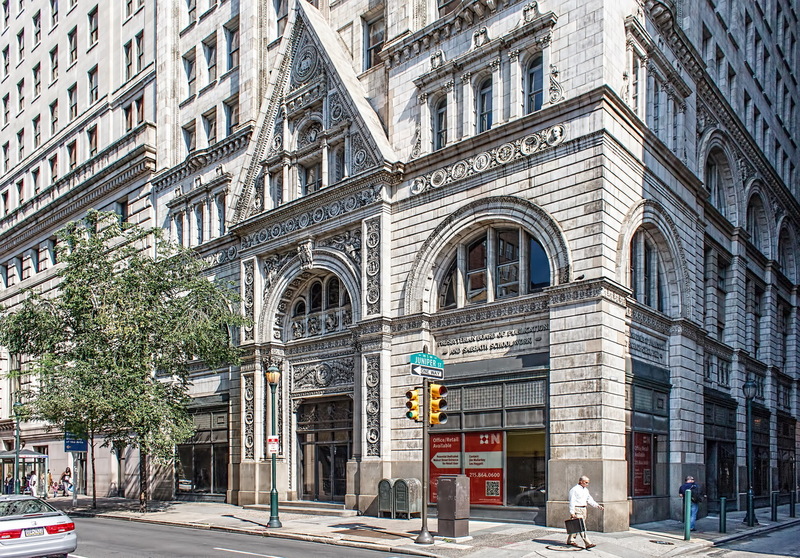 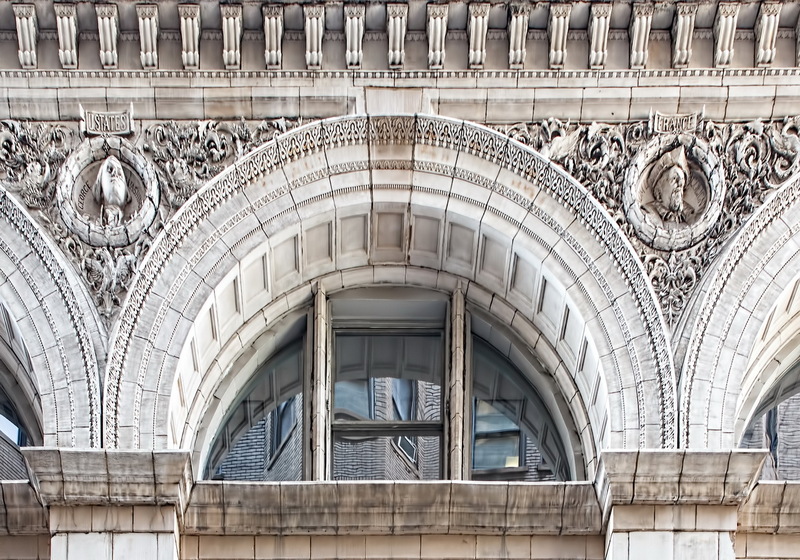 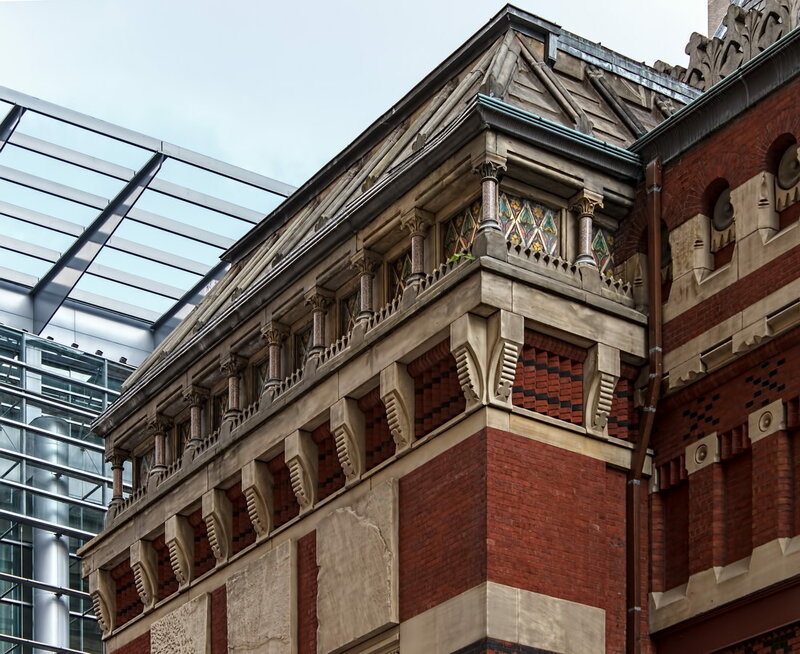 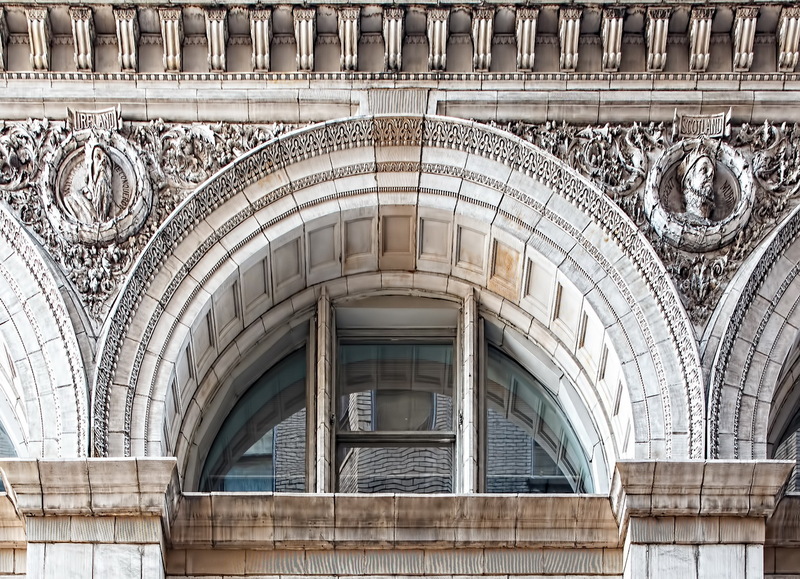 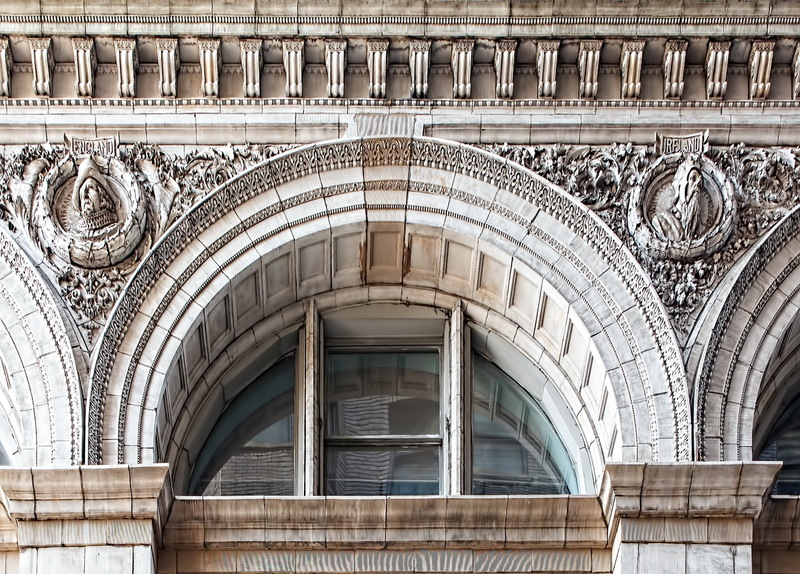 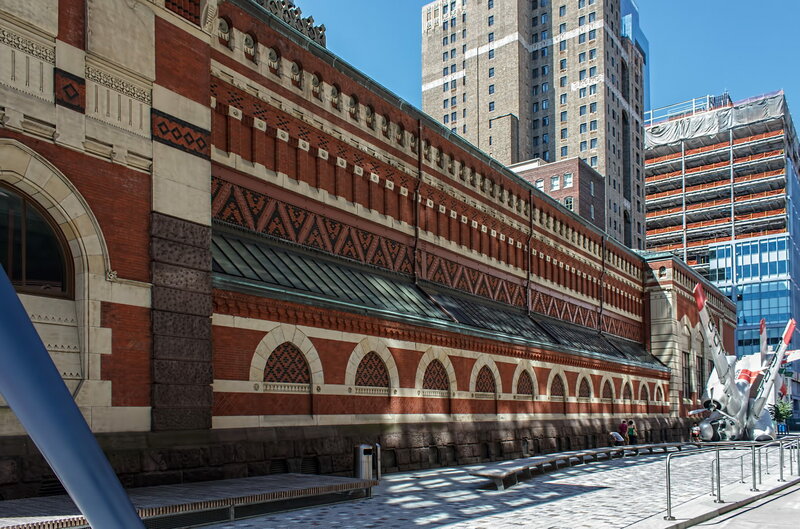 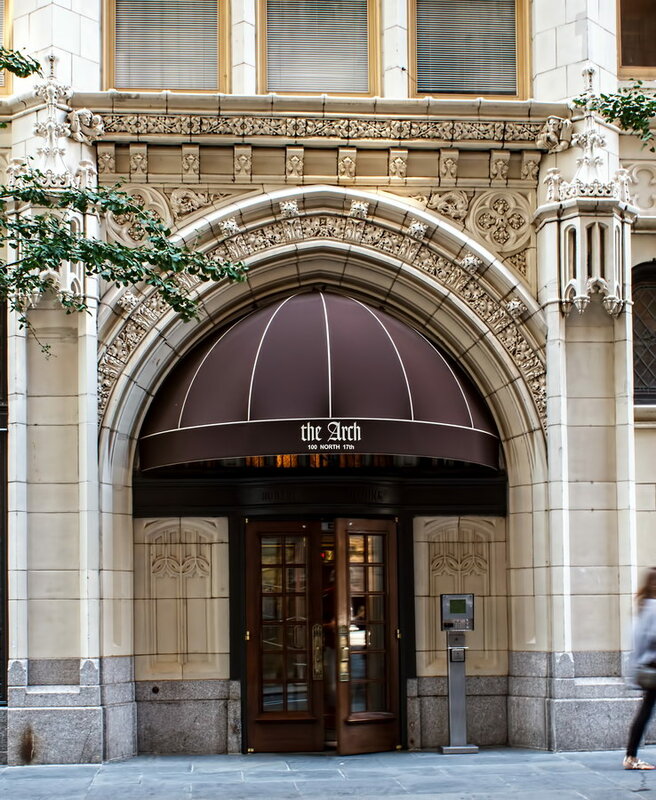 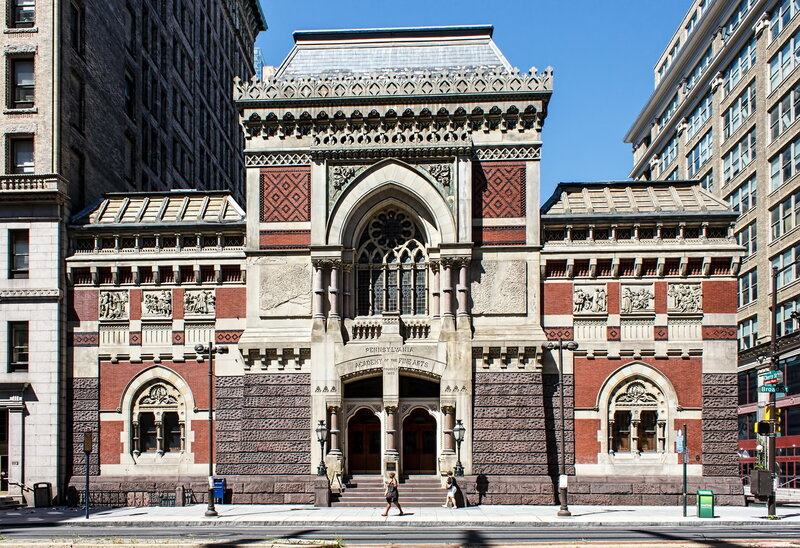 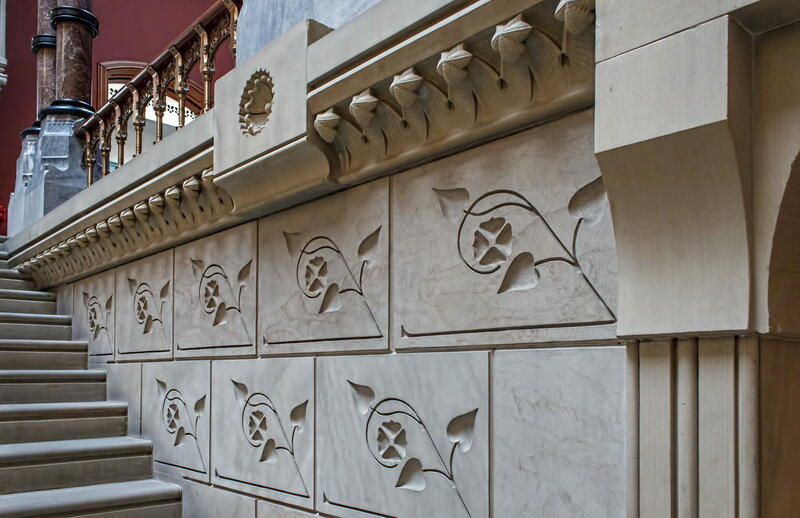 This building began life as the Lorraine Apartments – abodes for well-heeled Philadelphians. 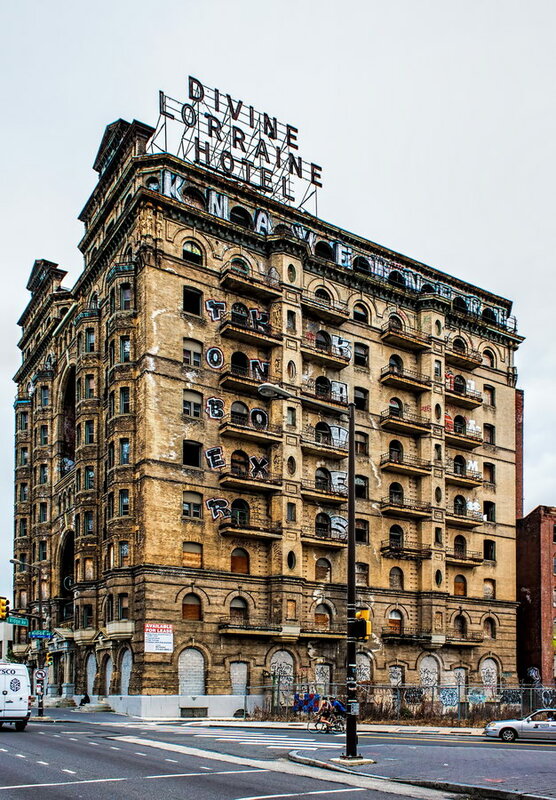 After a mere six years it was sold and converted to the Lorraine Hotel, a role it filled for almost half a century. 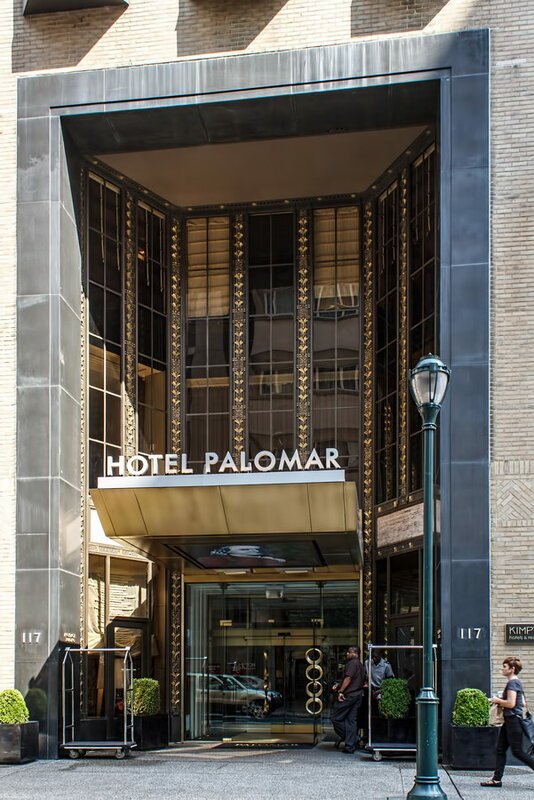 Then along came Harlem’s Reverend Major Jealous Divine, better known as Father Divine, whose Universal Peace Mission Movement bought the hotel in 1948. 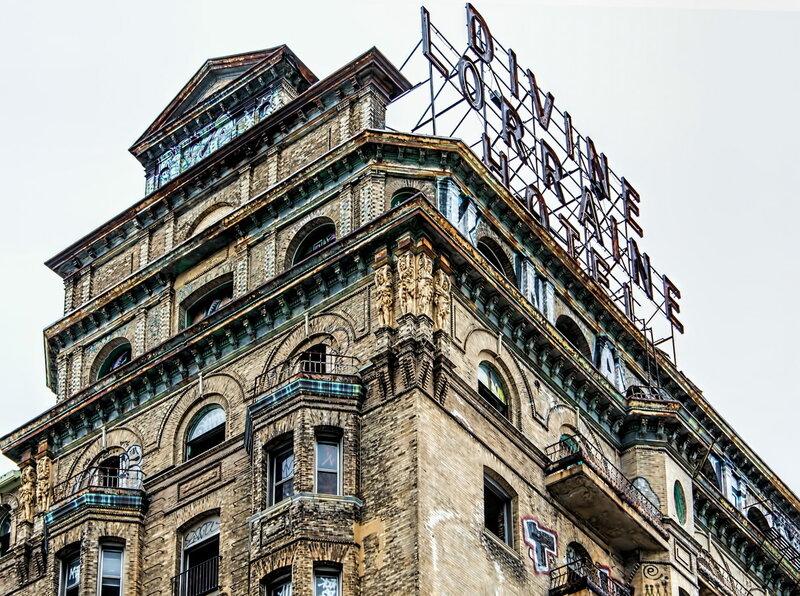 Divine, a black man who married a white woman at a time when interracial marriage was unthinkable, promptly radicalized the hotel. 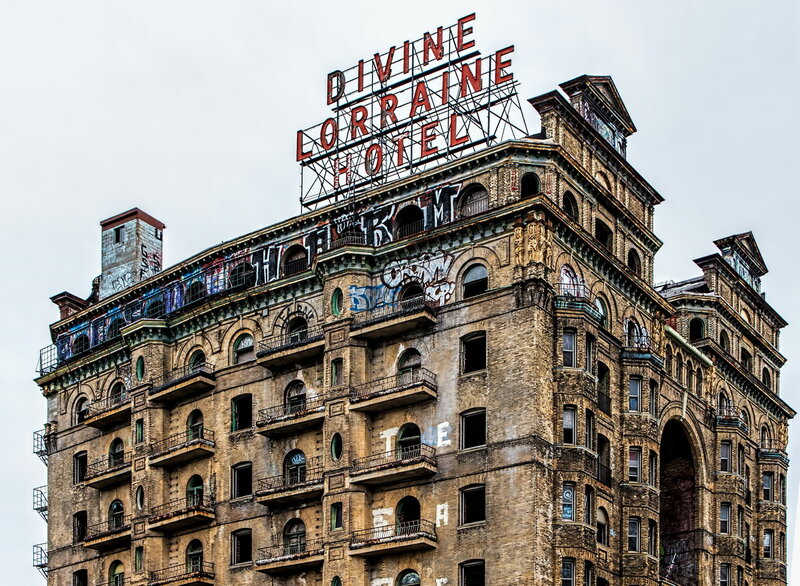 He renamed it Divine Lorraine Hotel, made it the first integrated U.S. hotel, required men and women (even if married) to stay on separate floors, converted ballrooms to places of worship, and installed a low-cost restaurant for the poor. 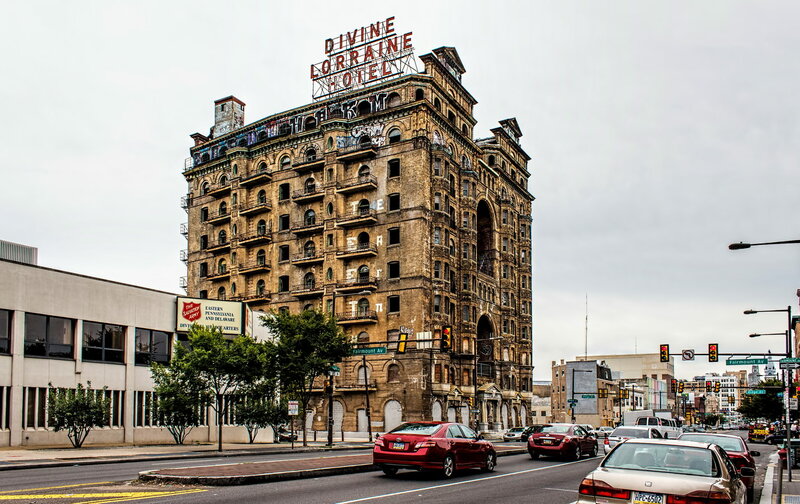 Though Father Divine died in 1965, his followers continued the hotel until 2000, when they sold it to developers. 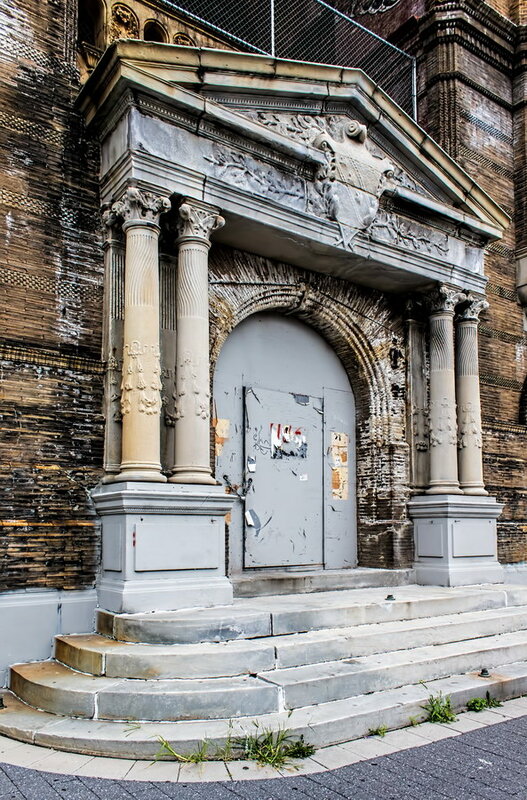 In 2006 the building was gutted for renovation, but the project was abandoned until fairly recently. 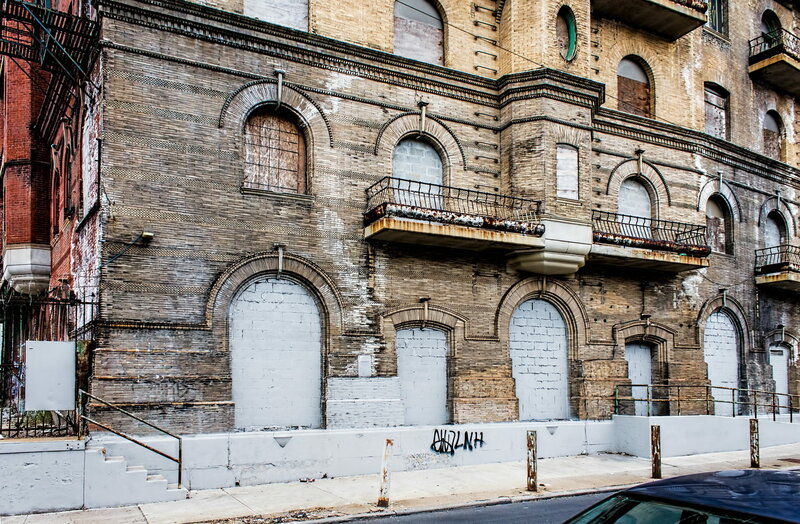 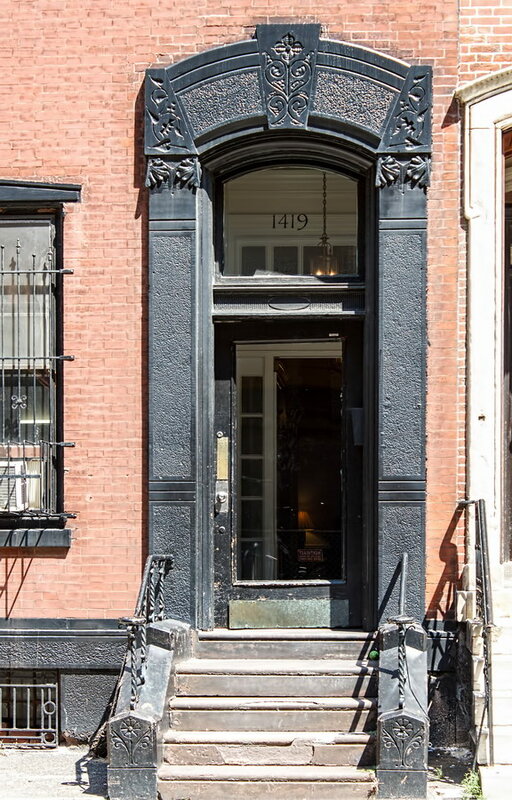 Developer Eric Blumenfeld bought the property at auction in October 2012, with plans to revive it as apartments. 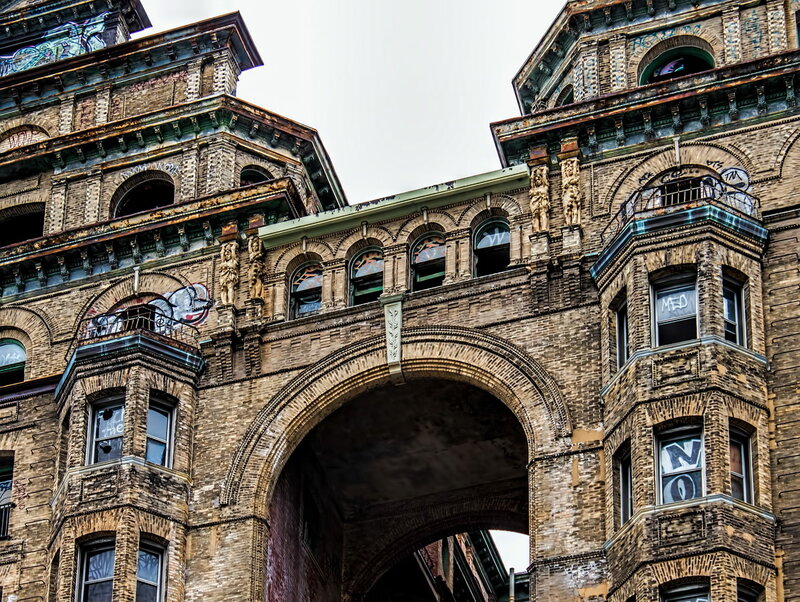 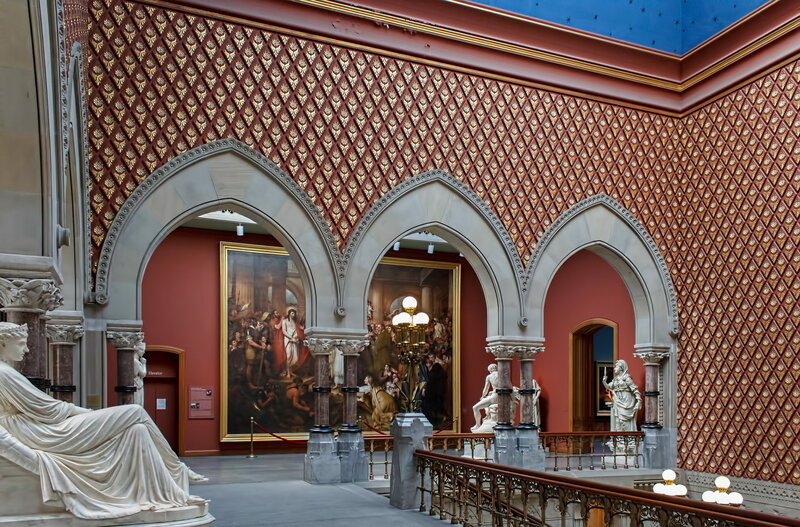 Divine Lorraine Hotel’s architect, Willis G. Hale, was born 1848 in Seneca Falls, N.Y. but moved to Philadelphia in the 1860s. 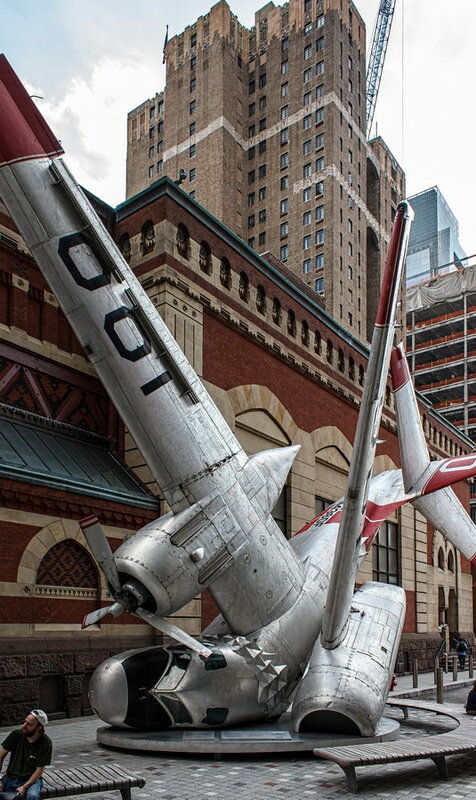 His creations are known as wildly inventive – but few examples survive. 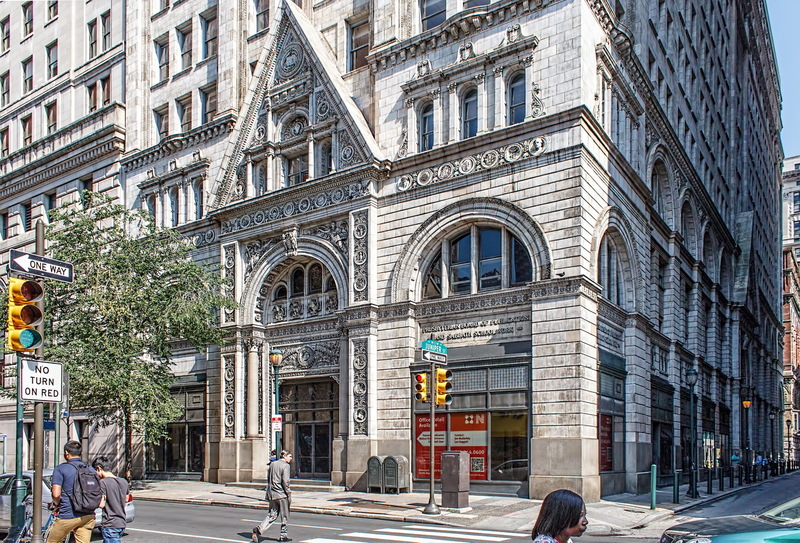 May 4, 2014 Philadelphia1897, Joseph M. Huston, Philadelphia, Witherspoon Building. 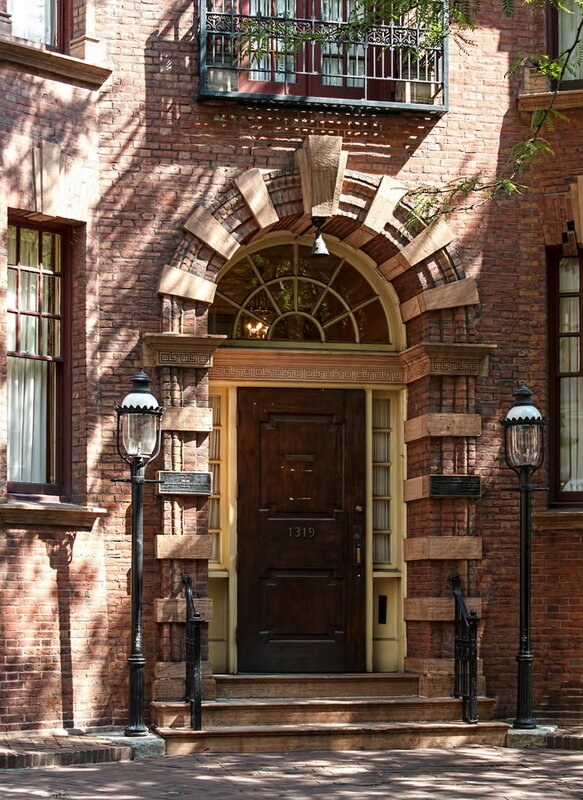 That was indeed an appropriate objective for the Presbyterian Board of Publication and Sabbath School Work. 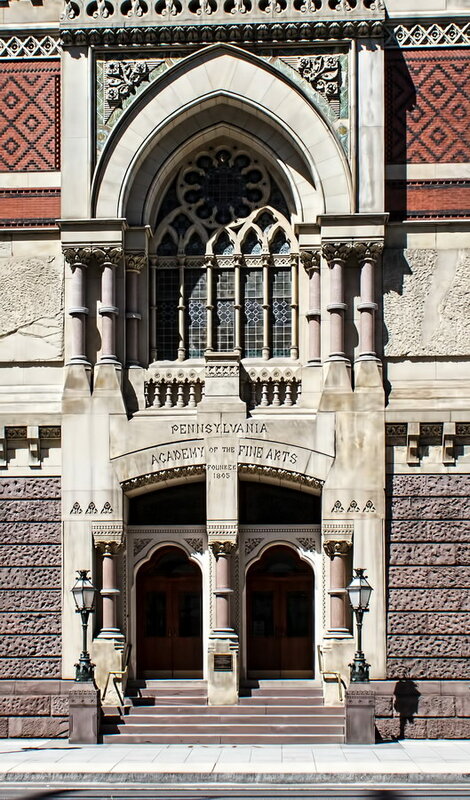 The building was named for John Witherspoon, first president of Princeton University (then College of New Jersey) and the only Presbyterian minister to sign the Declaration of Independence. 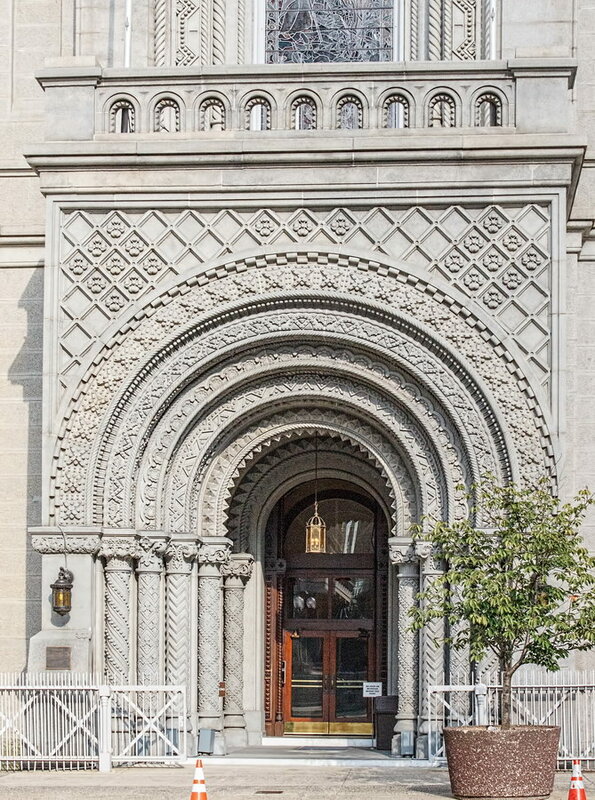 The numerous medallions and details of the Walnut Street and Juniper Street facades represent the boards and agencies of the Presbyterian church. 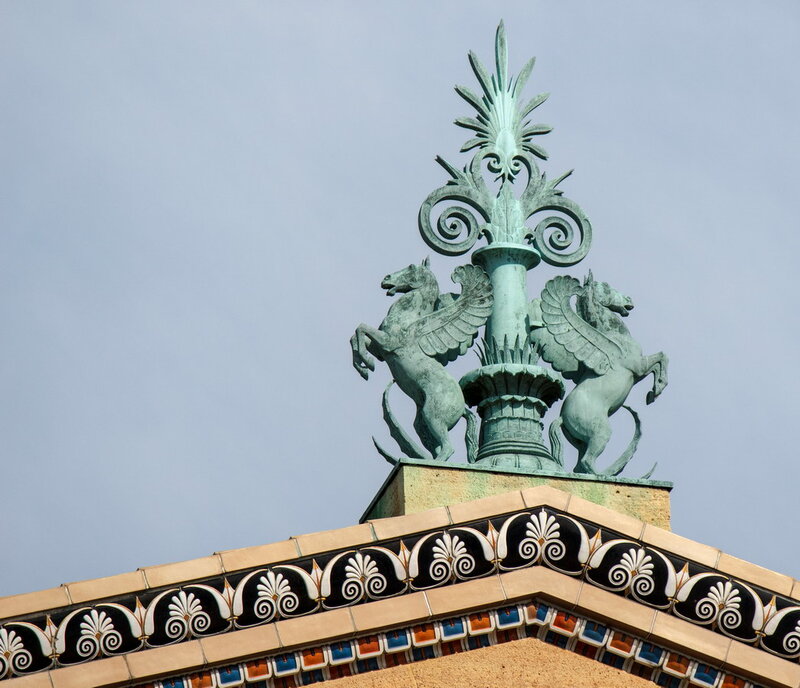 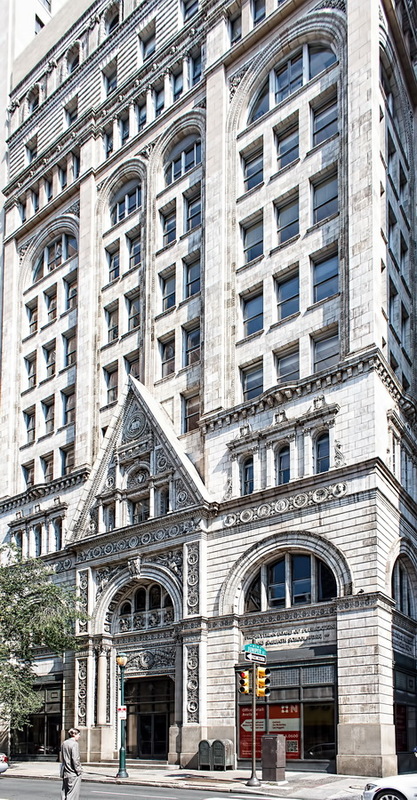 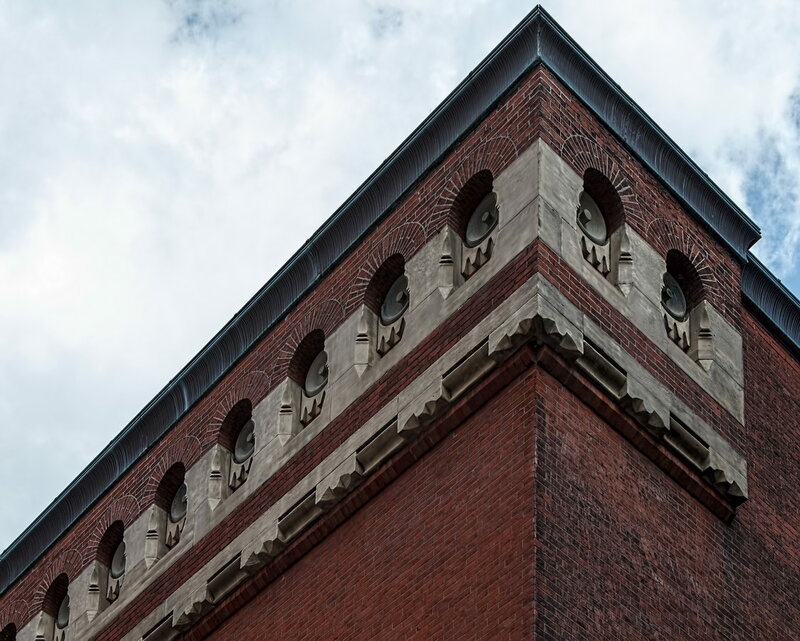 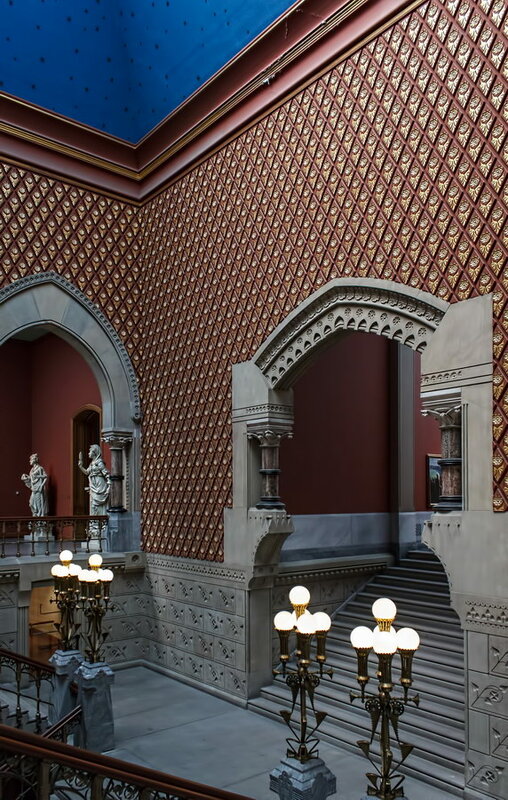 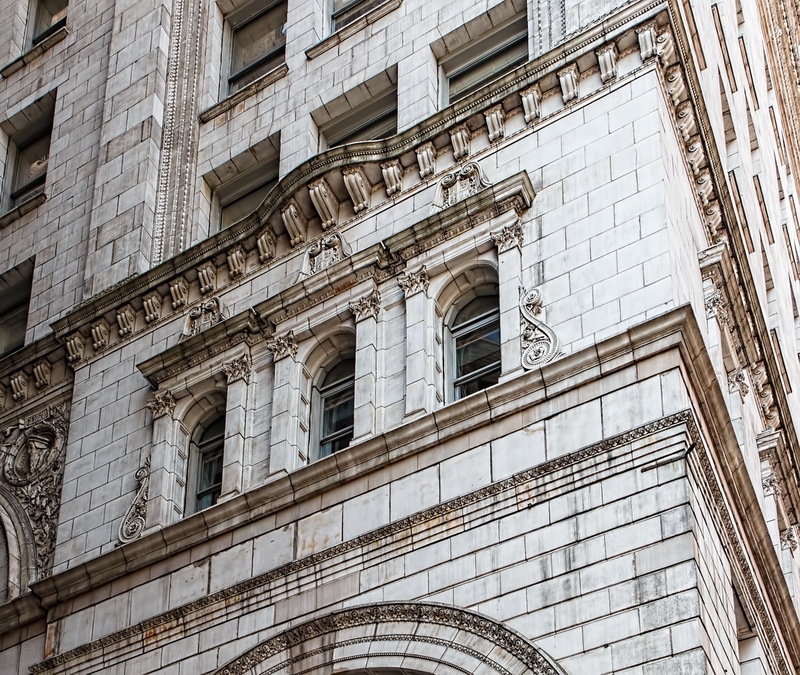 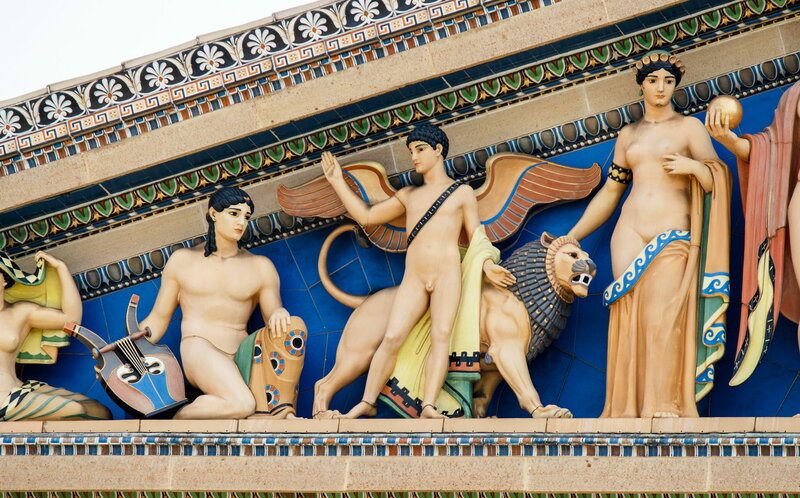 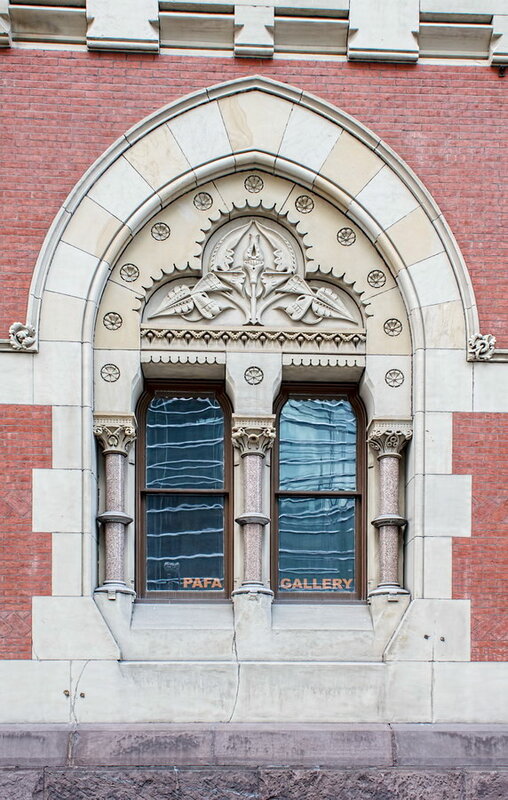 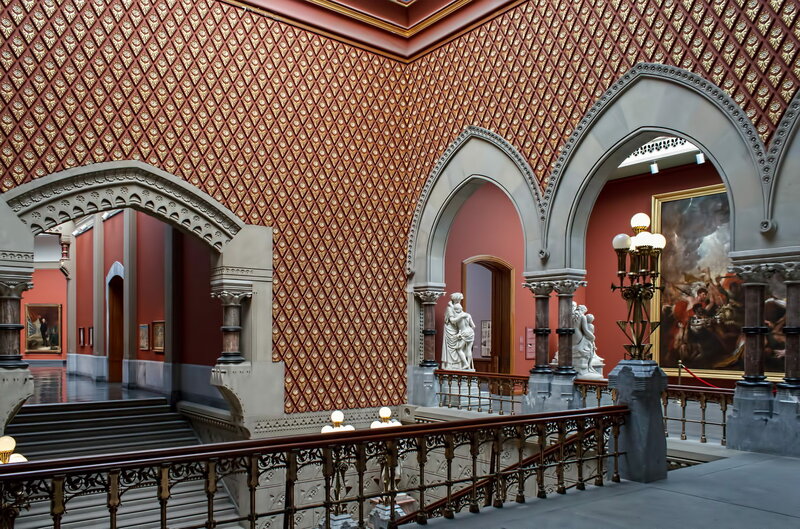 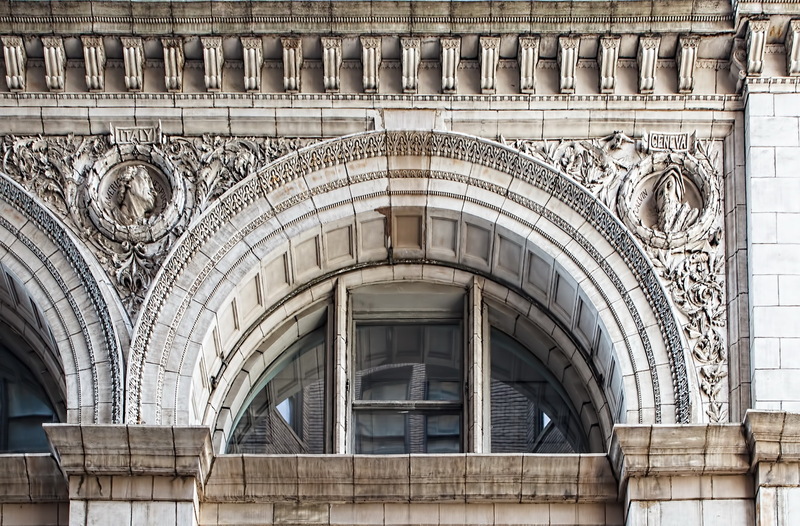 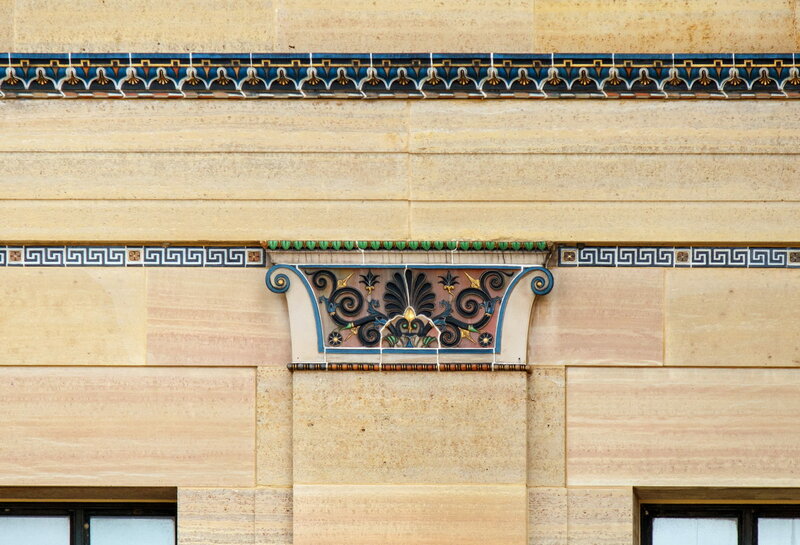 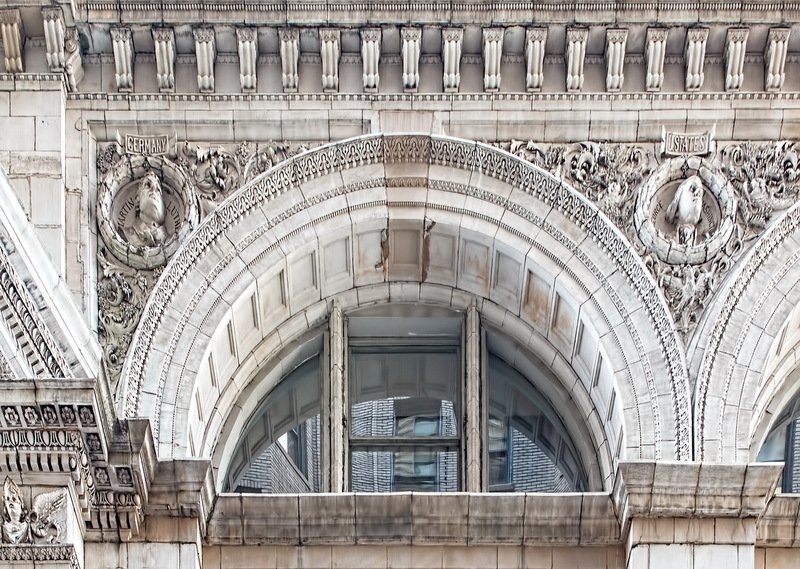 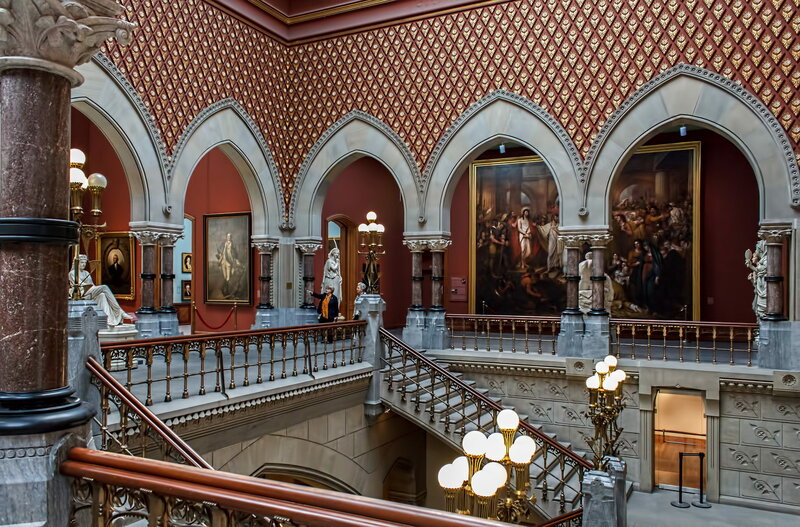 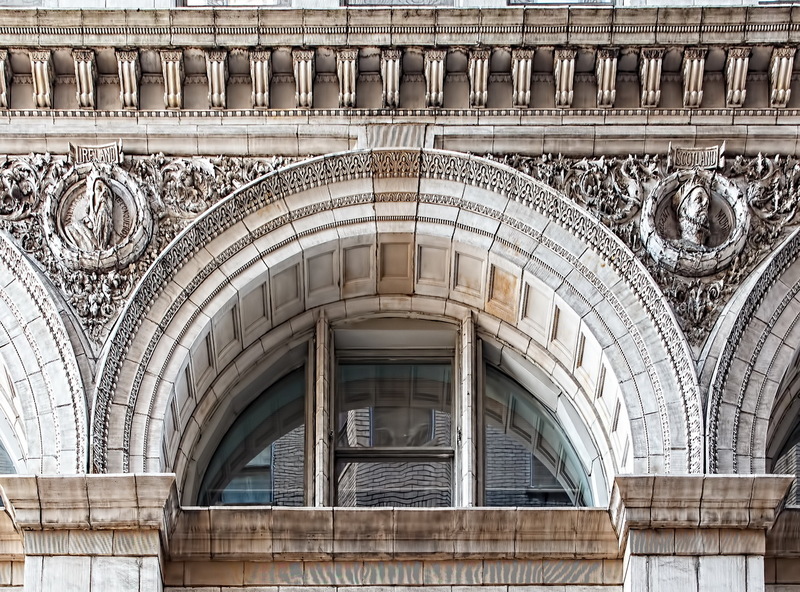 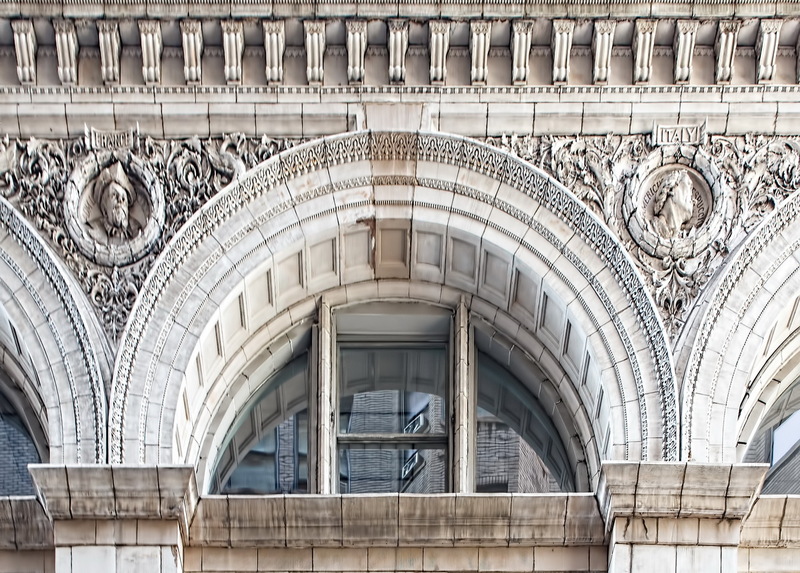 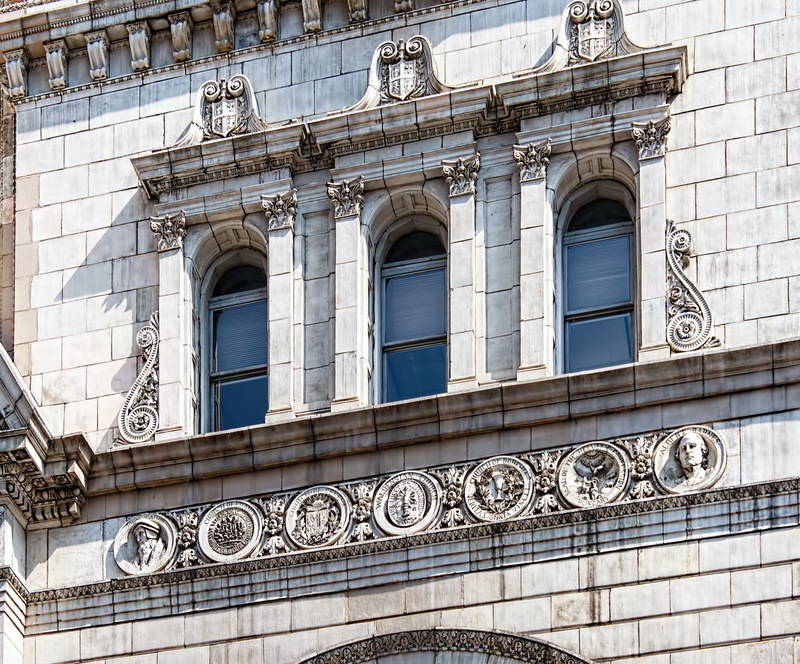 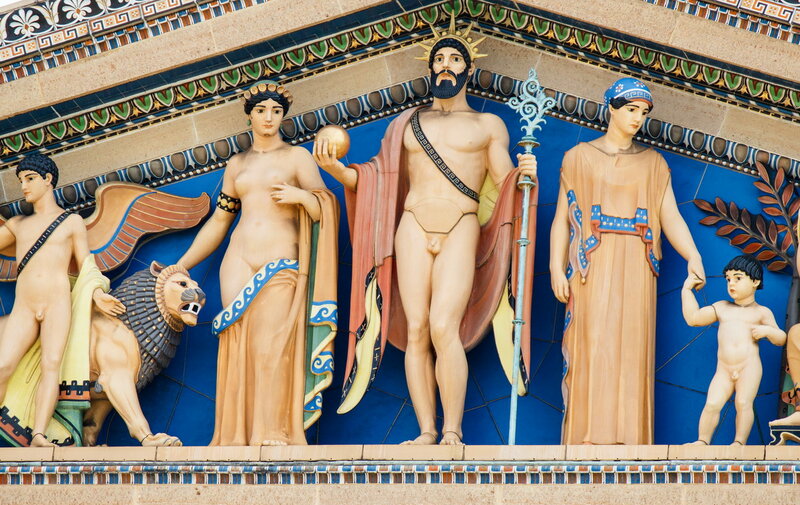 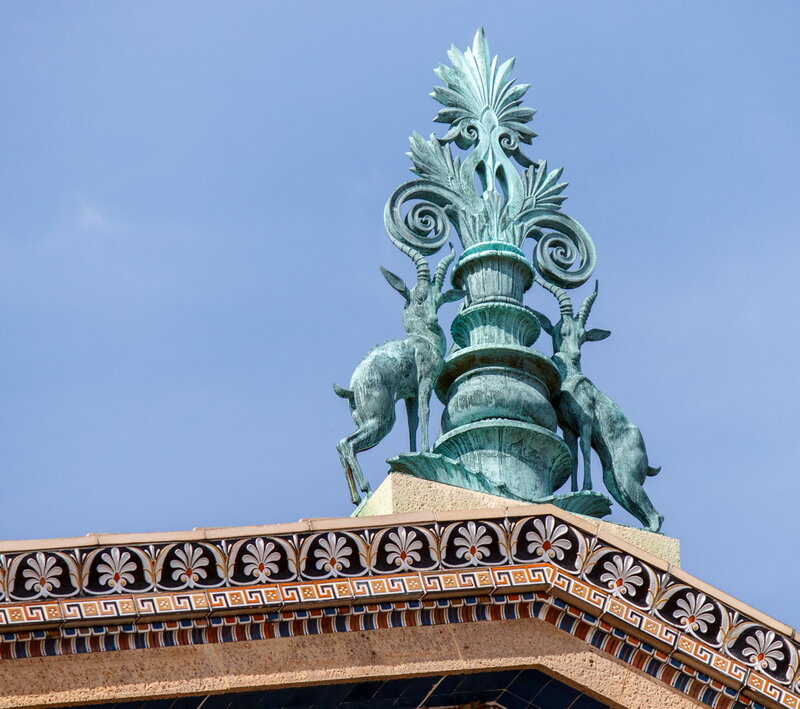 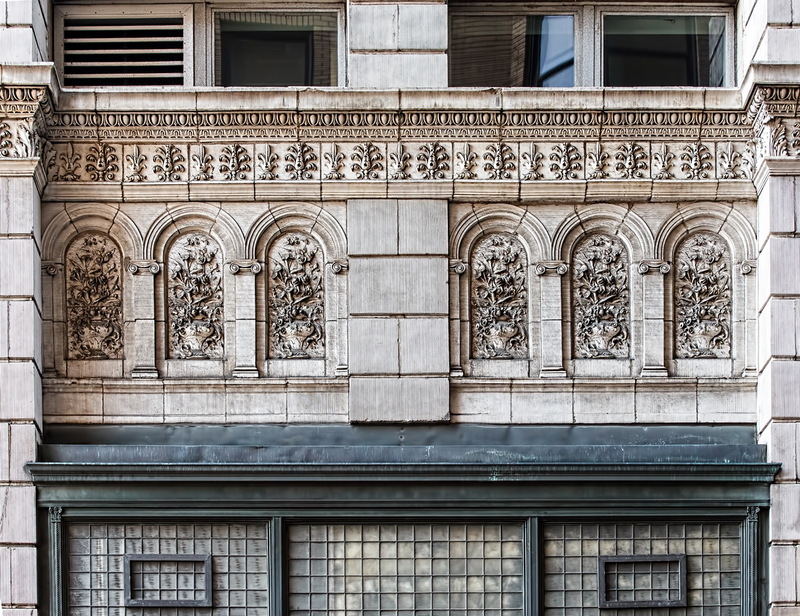 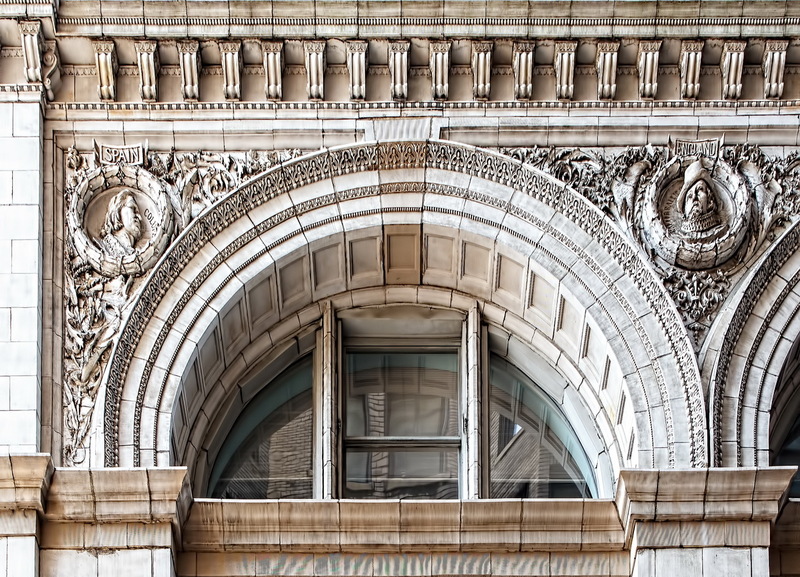 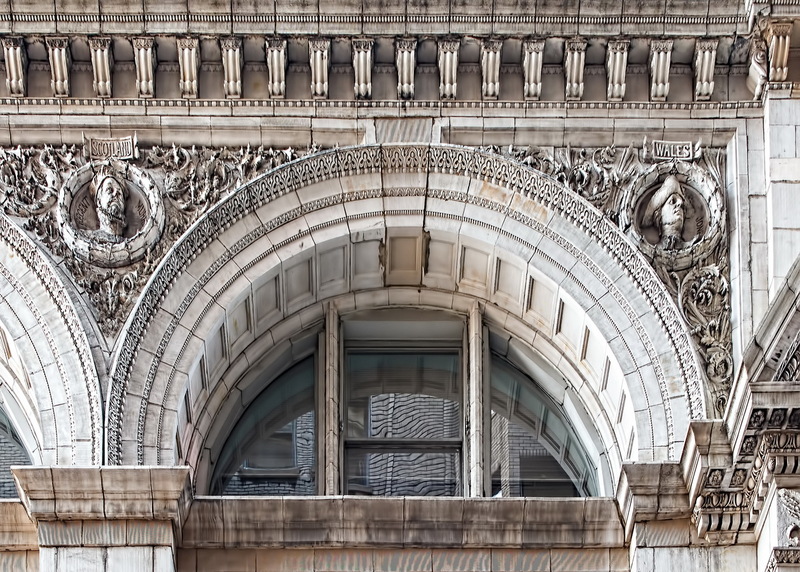 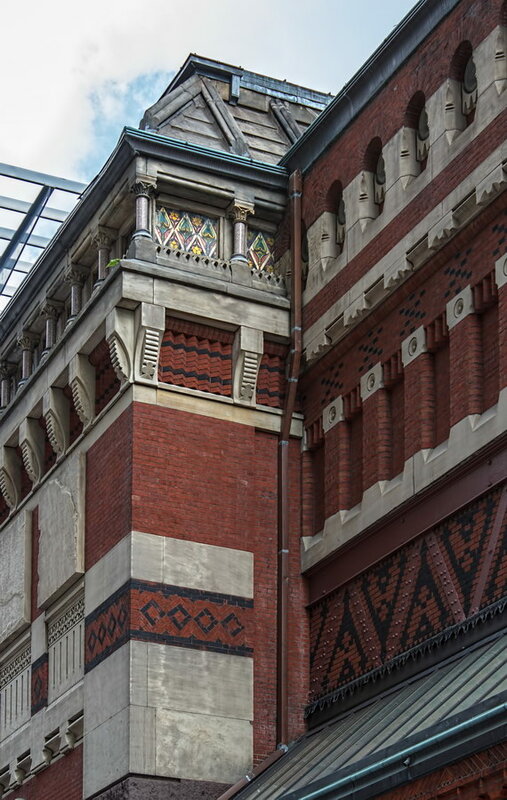 Originally the building’s facades also carried 16 terra cotta statues. 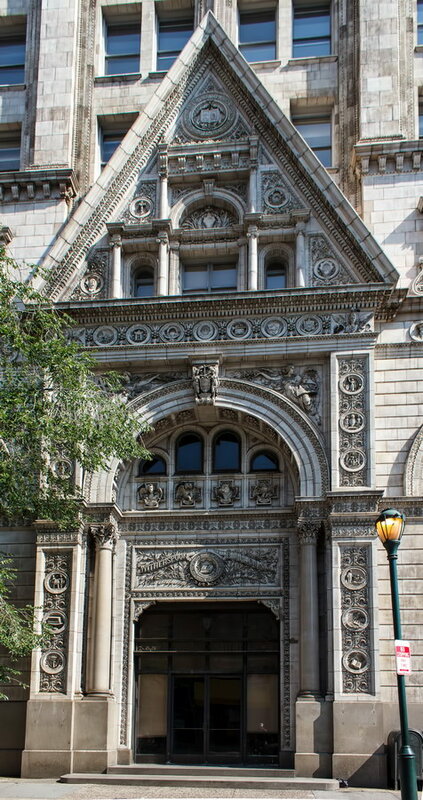 Six of the statues, of key figures in the history of the Presbyterian Church, were placed above the entrances. 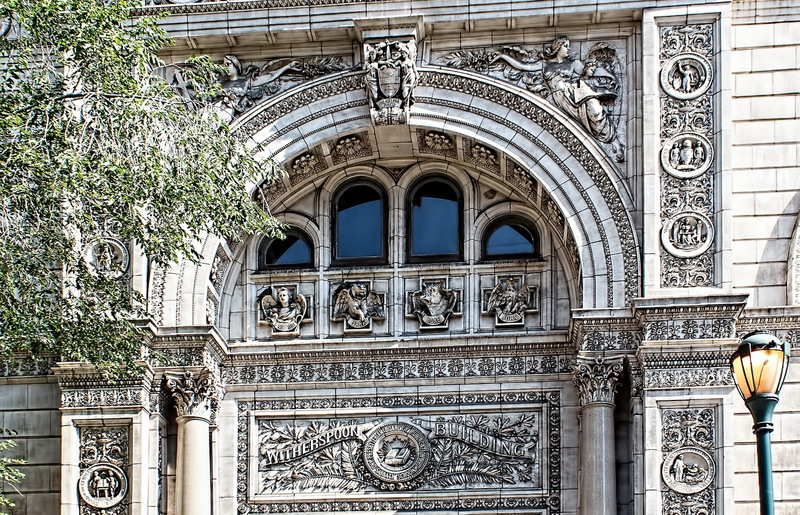 Ten statues, of Old Testament prophets, flanked the eighth floor arches. 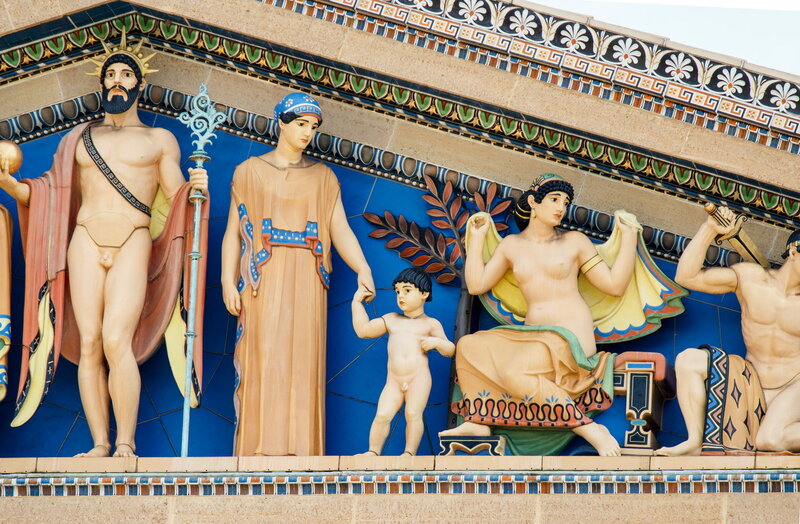 The statues were removed in 1961 for safety concerns. 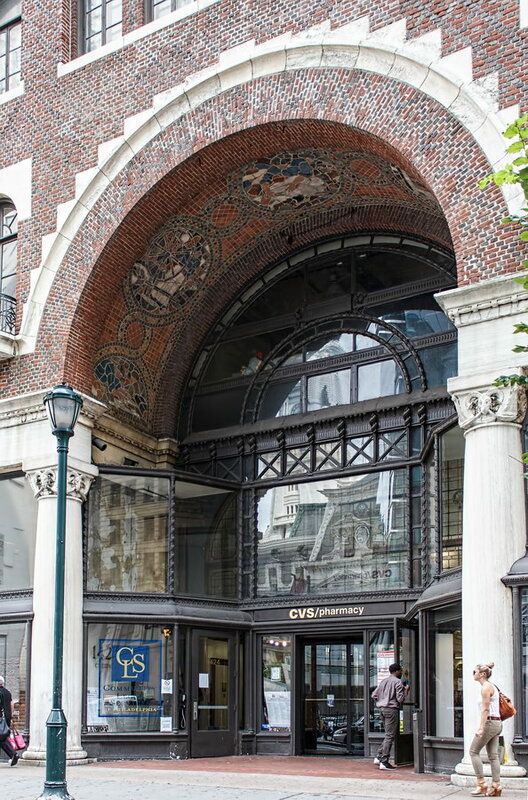 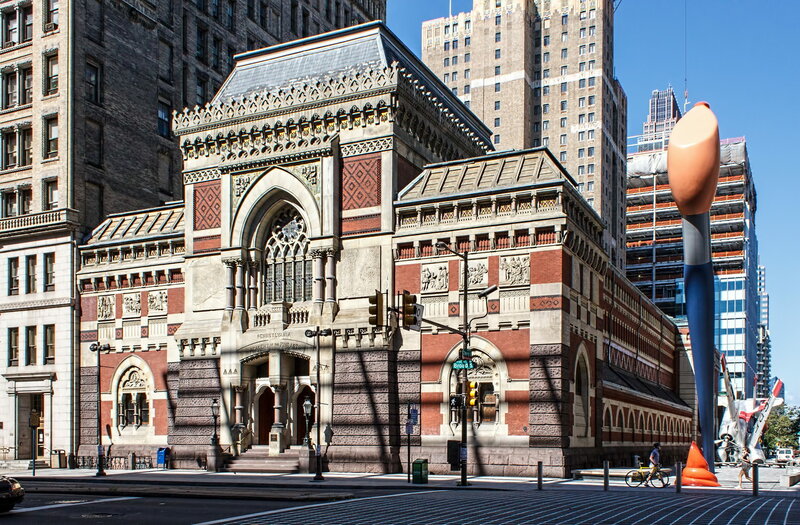 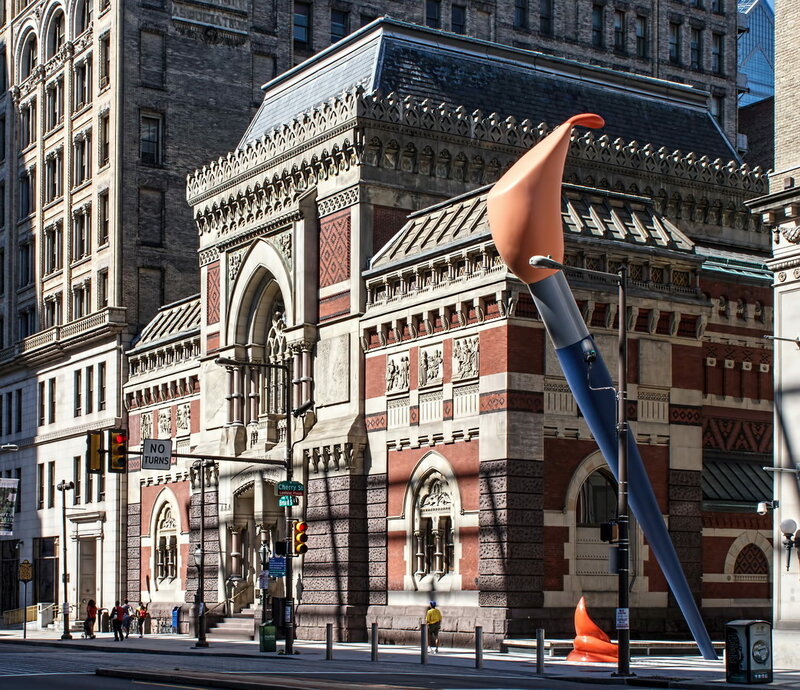 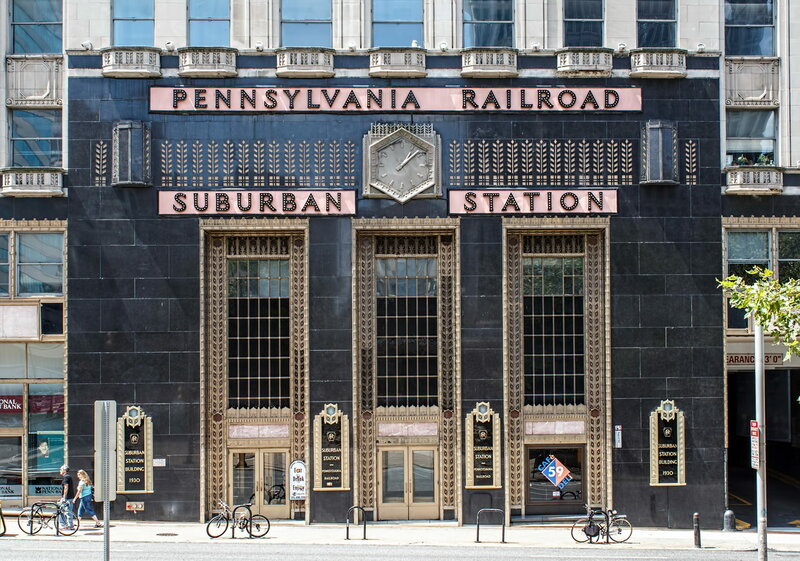 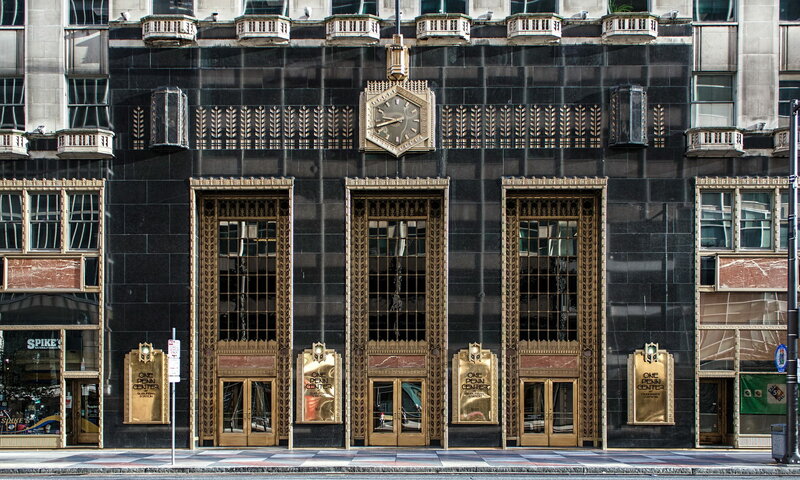 It seems odd that this building is absent from Philadelphia’s architectural guidebooks. 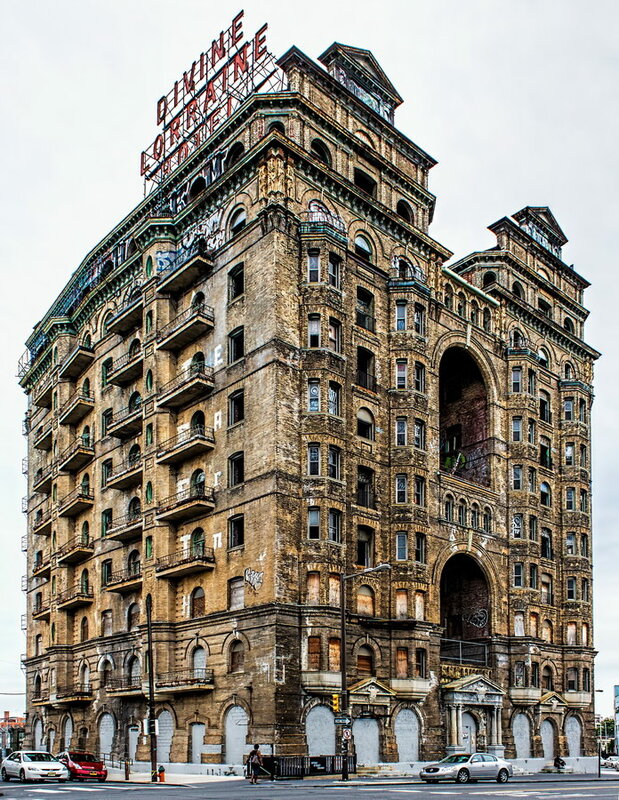 A case of too many other more important landmarks, or a snub for some reason?